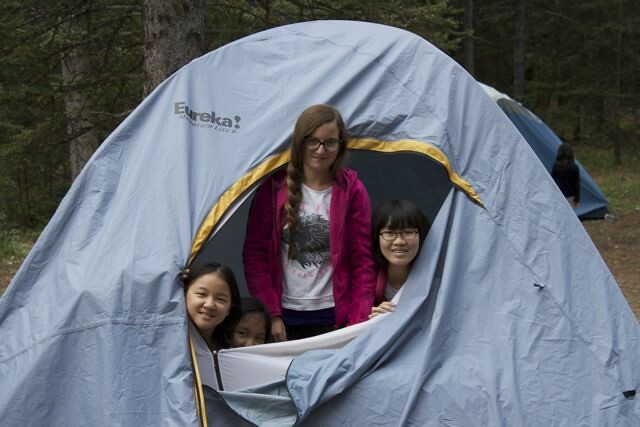 Chattering Wapitis – July 12-17, 2015 – CAMPING! 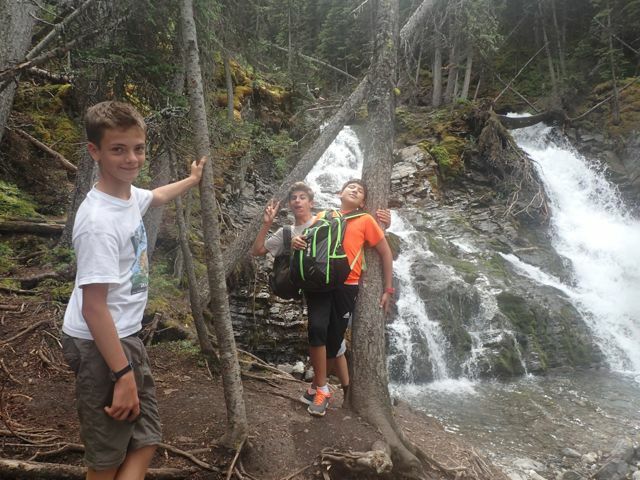 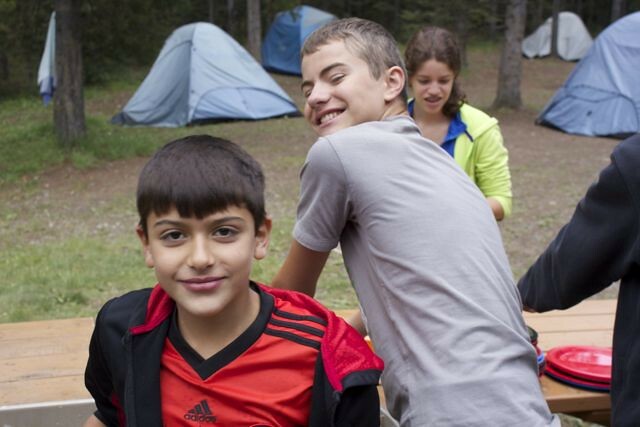 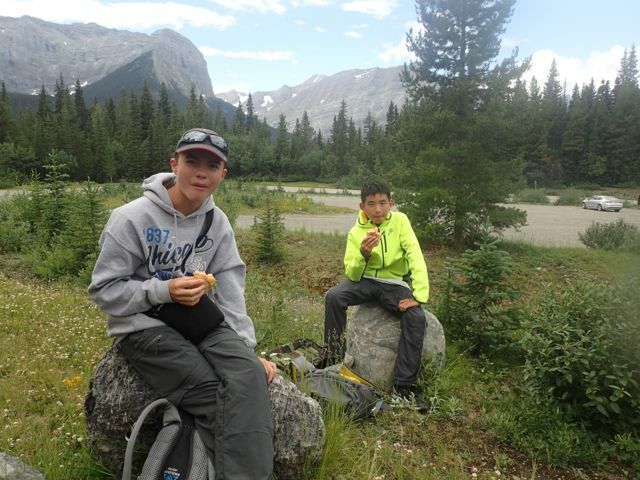 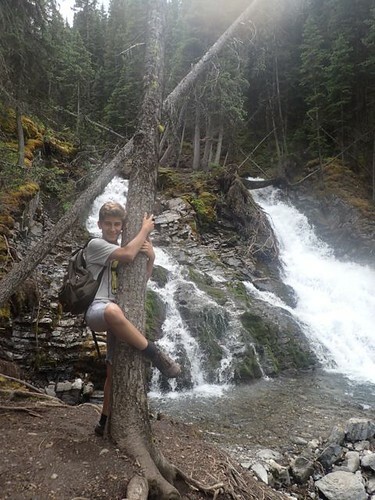 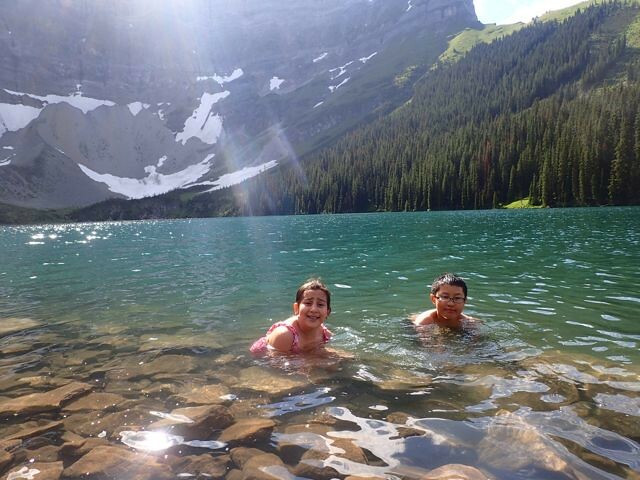 The Wapitis are back from our 5 day wilderness adventure camping in the Canadian Rockies! 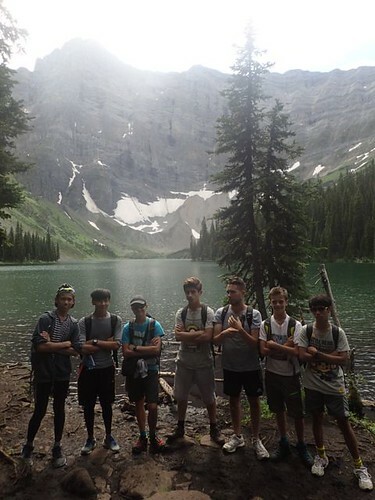 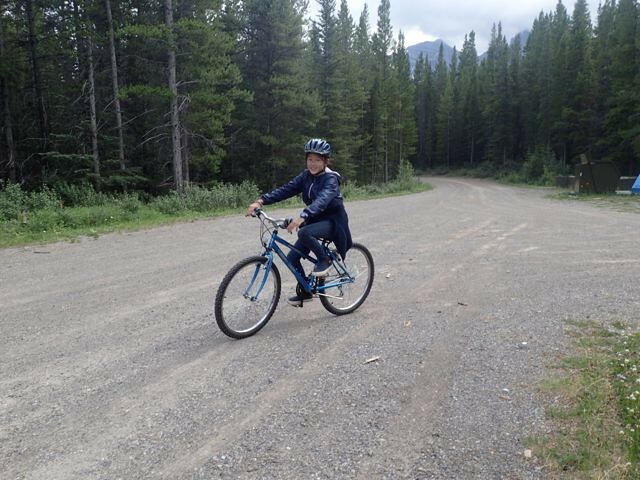 On Sunday July 12th we headed out to Kananaskis Country after lunch and arrived in the afternoon at our Lower Lakes group campsite. 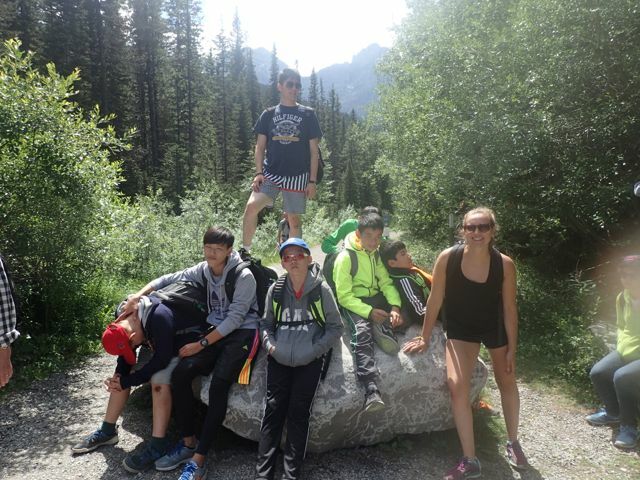 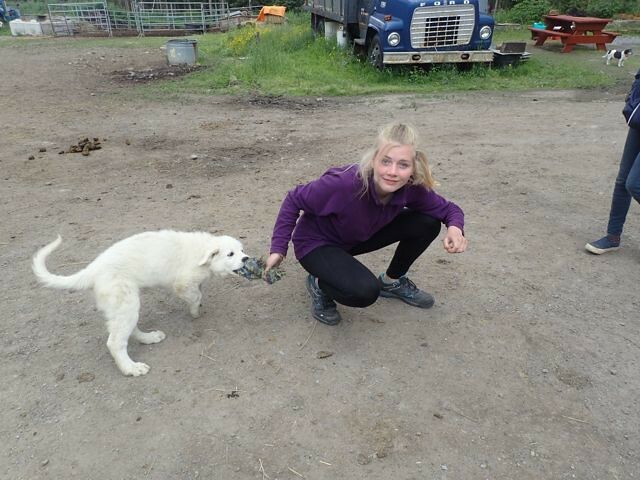 We spotted some local wildlife on the drive there, some big horn sheep and a questionable bear sighting. 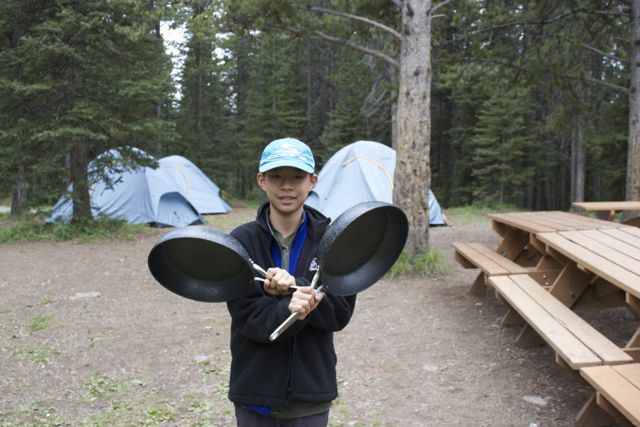 We set up camp very efficiently and soon dinner was underway on the camping stoves. Our first meal consisted of yummy kabobs, salad and vegetables. 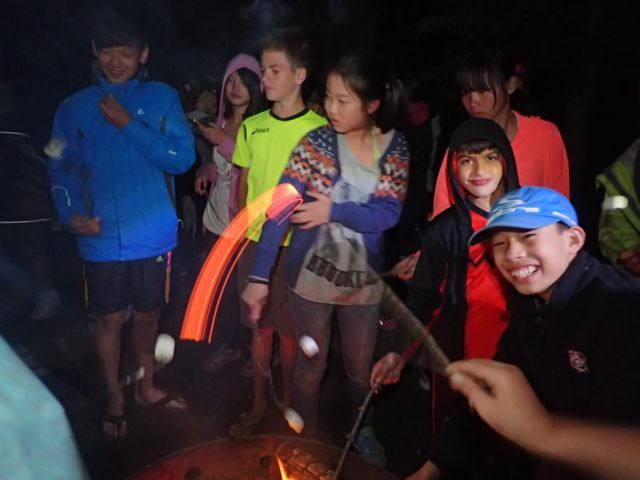 We had a campfire full of funny stories from our campers and went off to sleep in our tents, cuddled up in our sleeping bags to combat the chilly night. 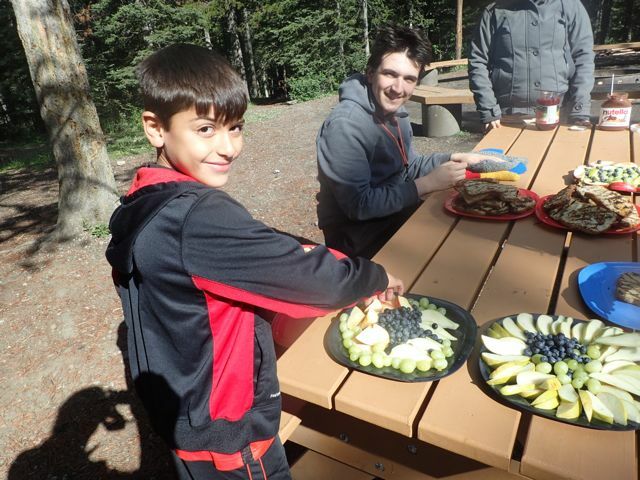 On Monday morning we fuelled up for our day with French toast, maple syrup and fruit for breakfast. Then after cleaning up, everyone got ready for our adventure of the day, which was a four-hour hike up to the pristine and picturesque Rawson Lake after a build-your-own-sandwich lunch. 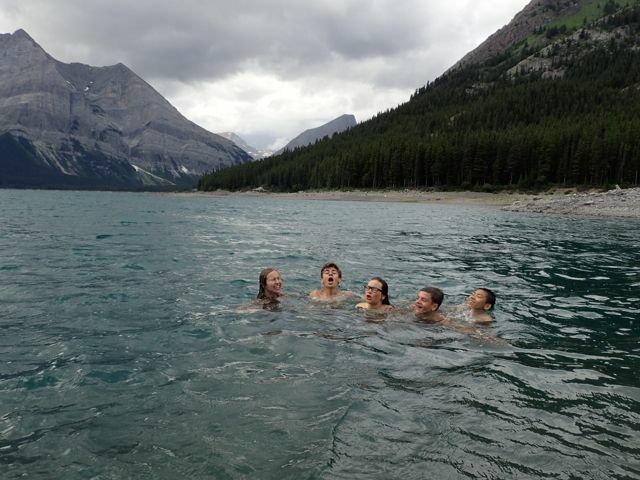 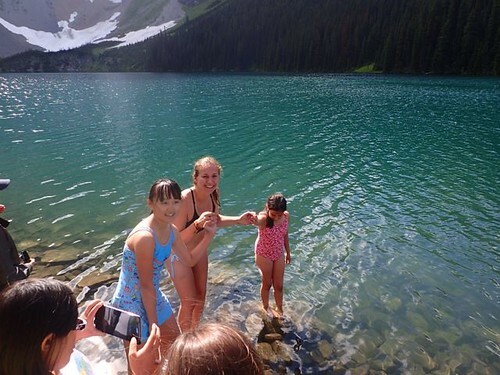 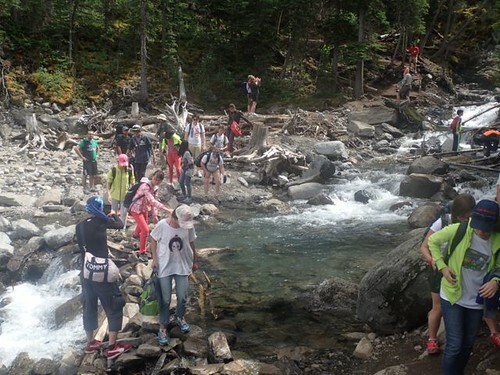 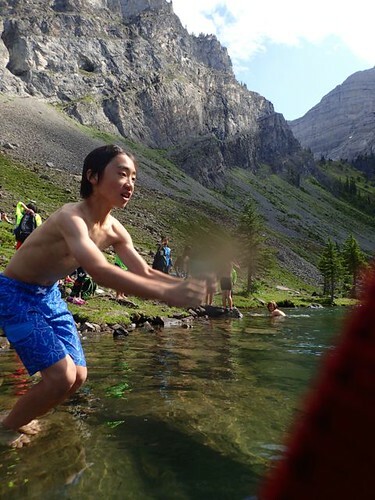 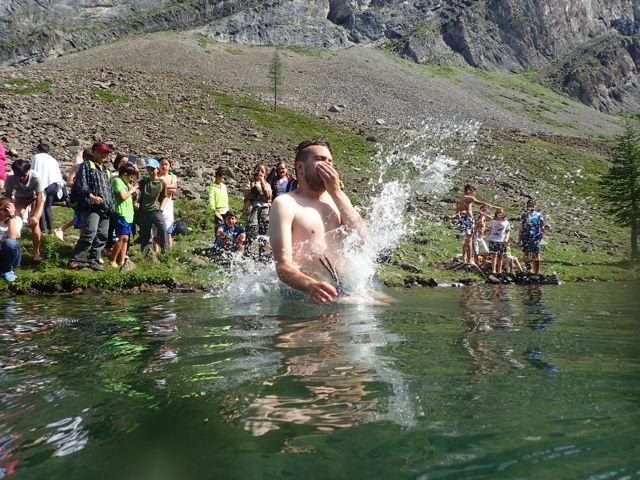 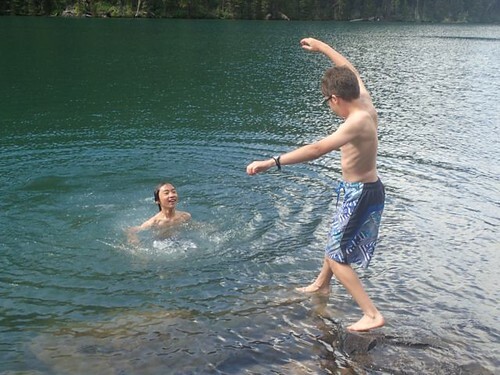 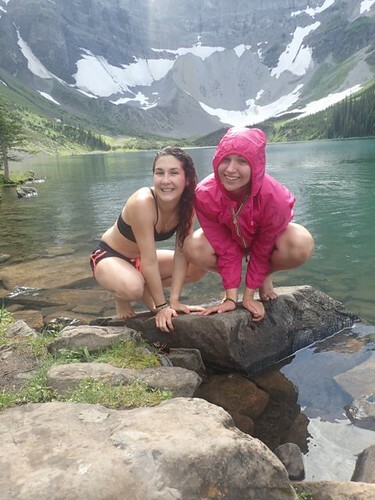 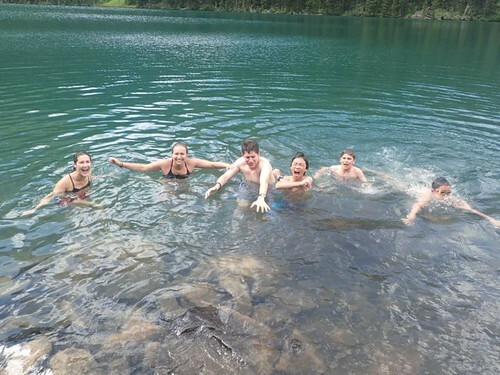 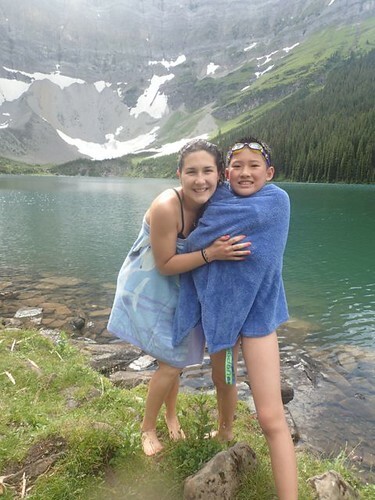 Many of the students and all of the teachers dove into the cold glacial lake to cool off after working up a good sweat on the hike up. 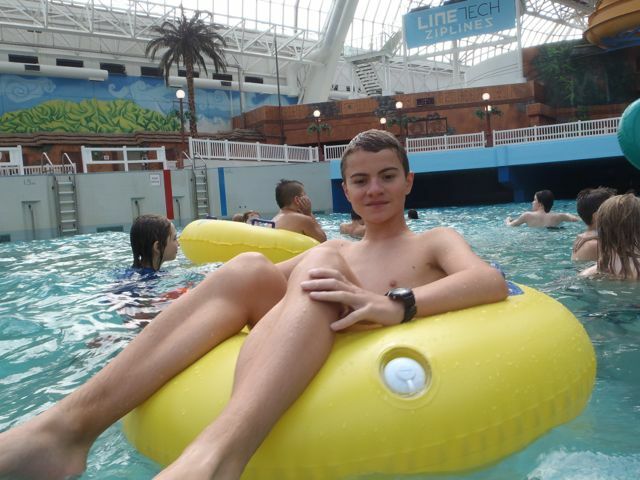 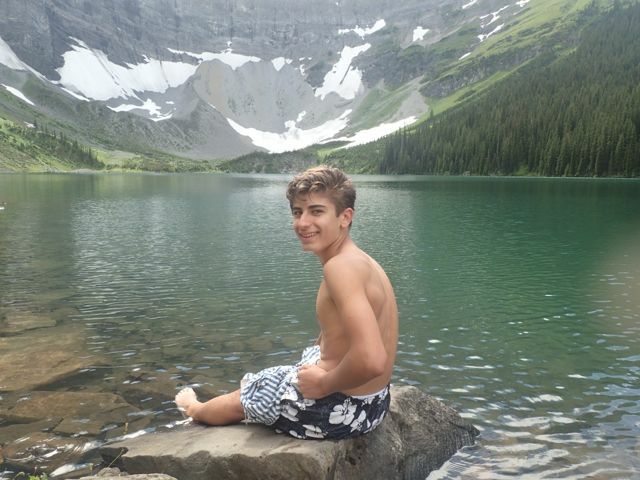 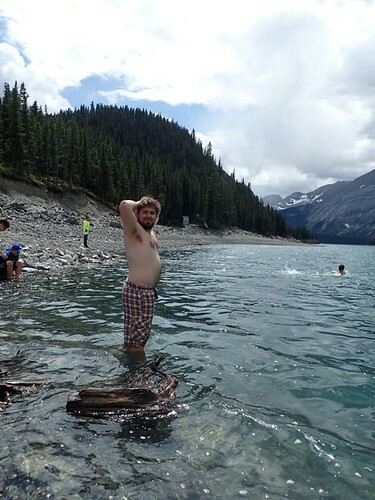 Justus from Germany won the competition of who could stay in the lake the longest…it apparently wasn’t cold compared to the Northern waters of his hometown. 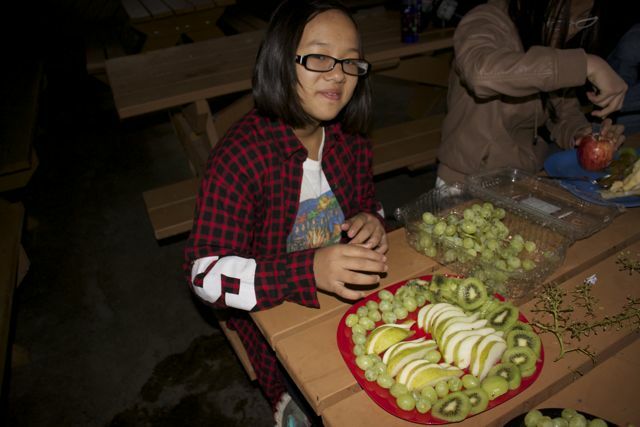 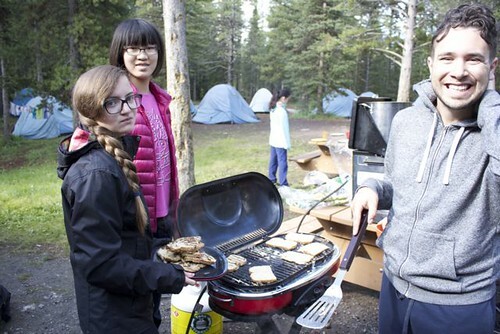 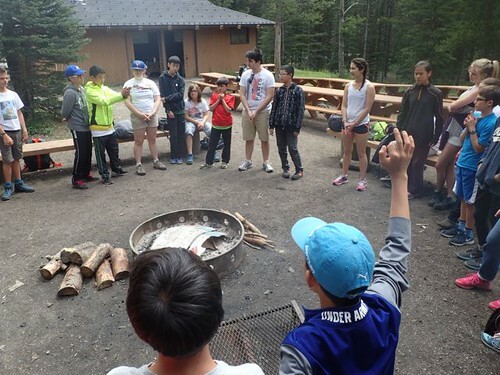 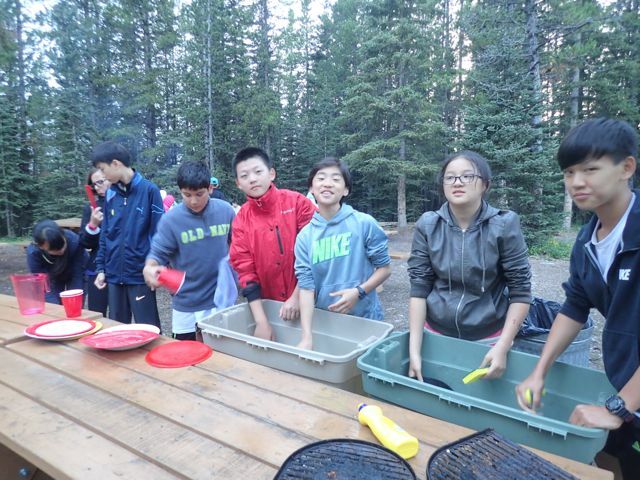 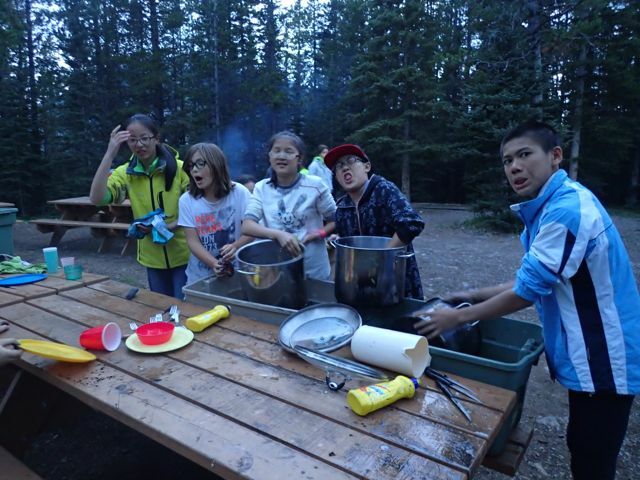 Once we arrived back at our campsite some students helped to prepare the campfire, while others helped to cook supper. 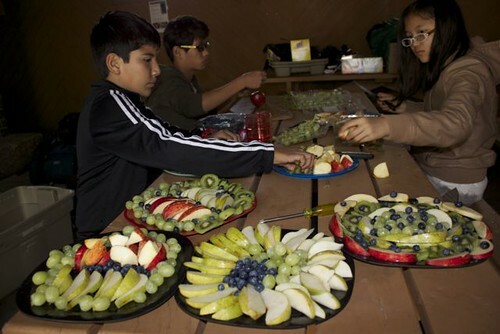 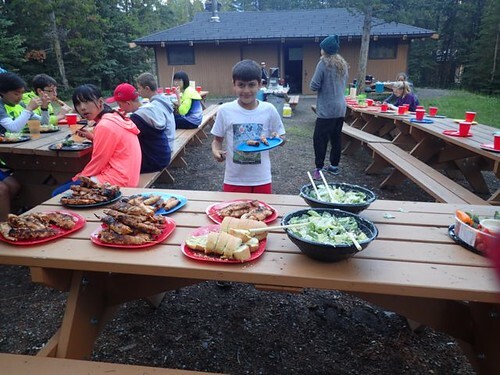 We enjoyed a meal of rice, chicken and sautéed vegetables, accompanied by salad and fruit and cookies for desert. 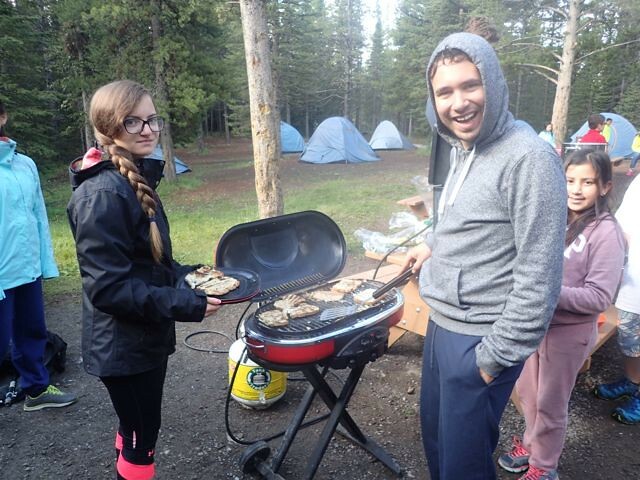 On Tuesday we took full advantage of the peace and quiet of the woods and slept in until 10am. 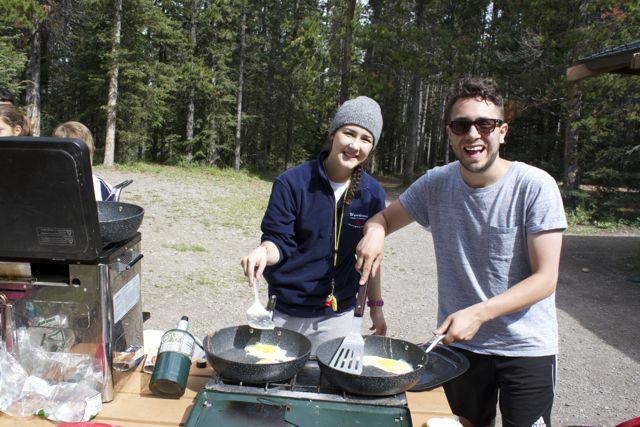 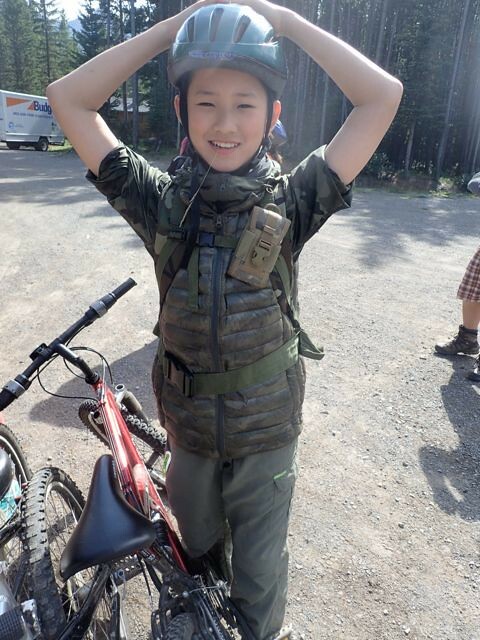 We ate a breakfast of English muffins, eggs, and turkey sausage and prepped for our day of mountain biking. 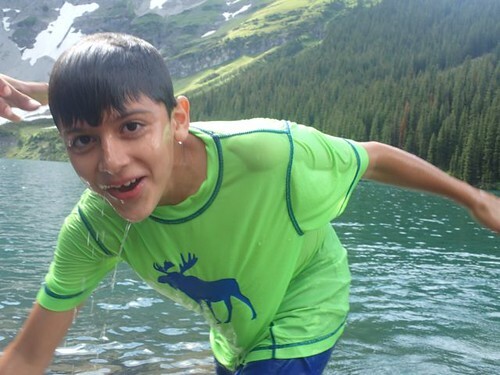 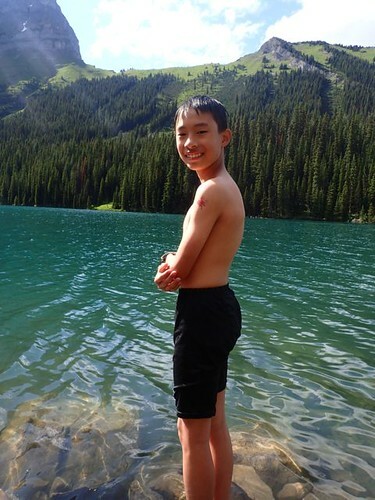 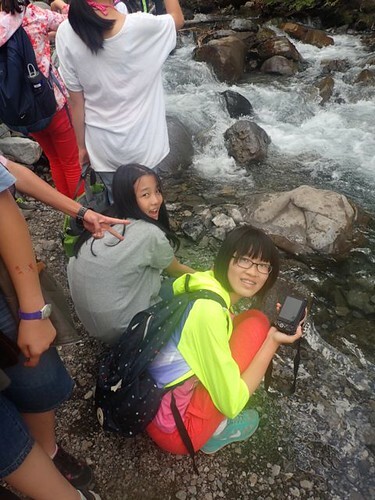 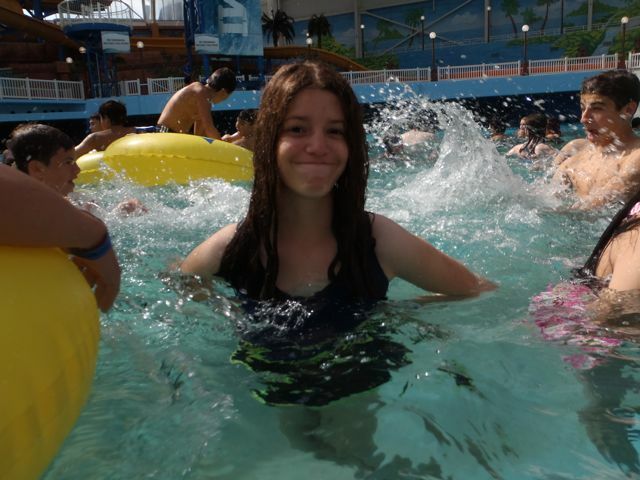 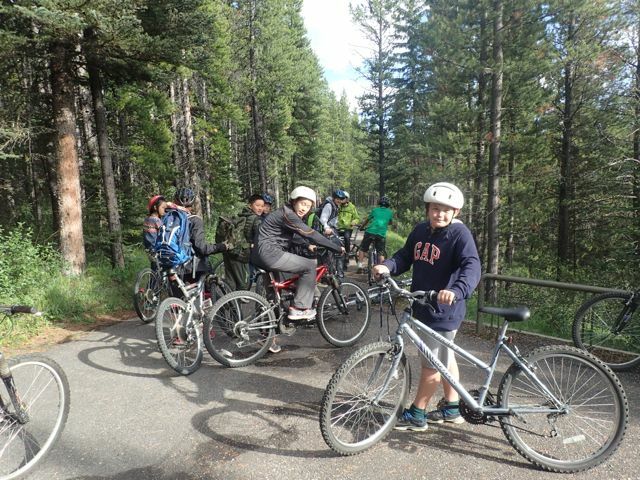 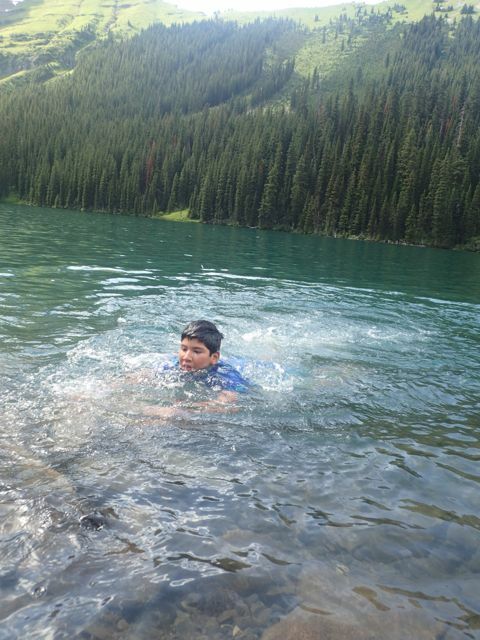 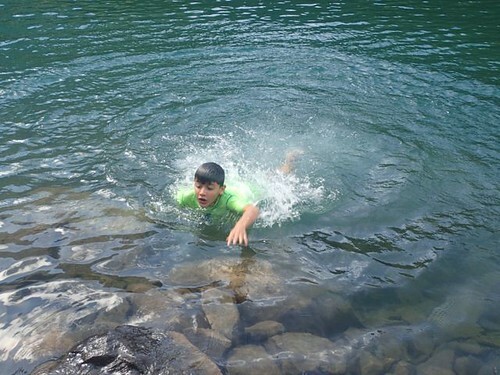 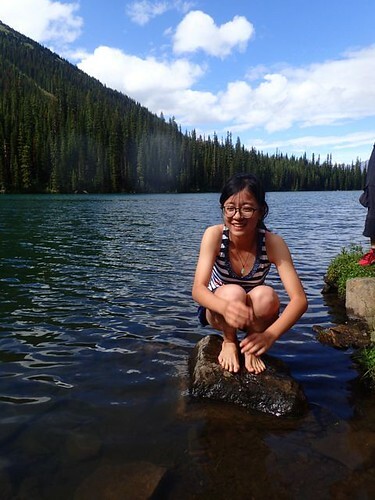 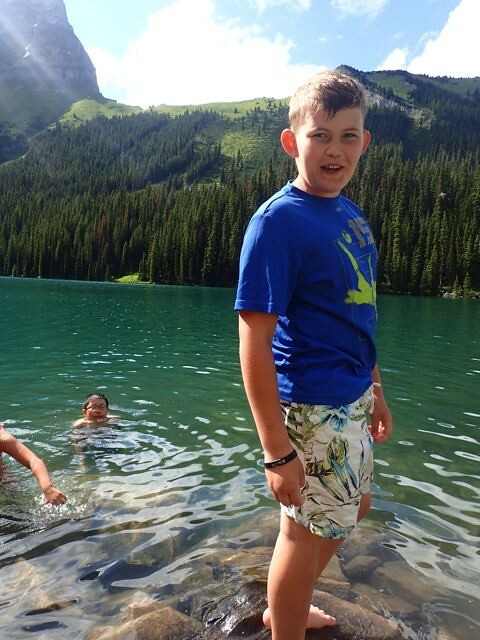 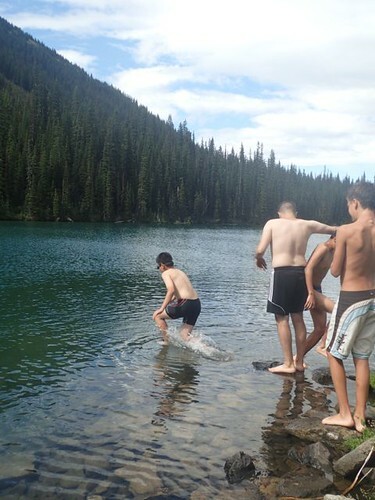 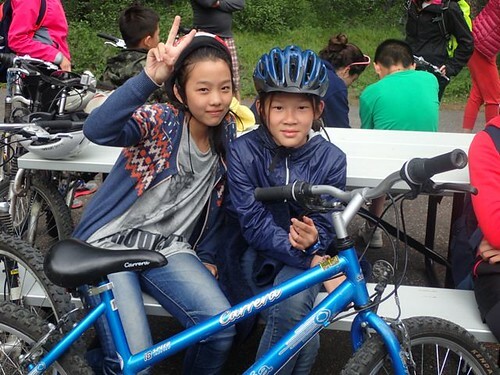 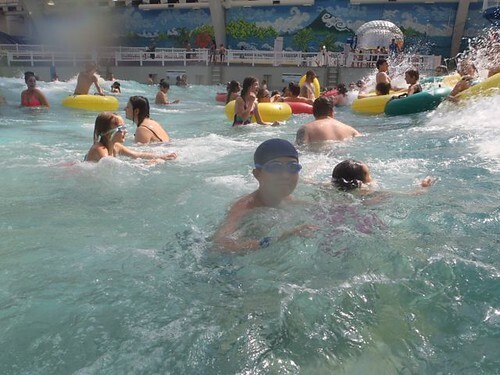 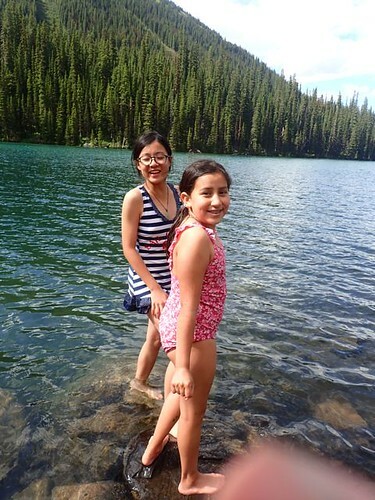 We split into two groups and the first group biked up and down big hills and was rewarded with a beautiful lake at the end, where a few students hopped in to cool down. Upon returning they ate a lunch of noodles, sausage, cheese and crackers and went off to play a fun game of Capture the Flag. 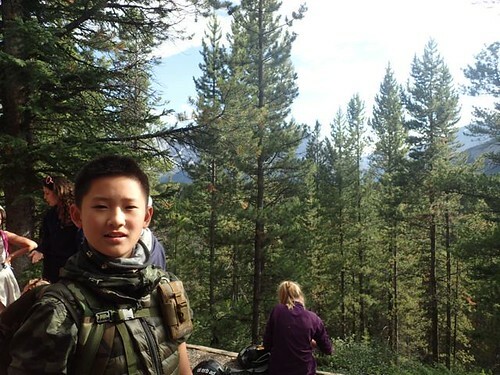 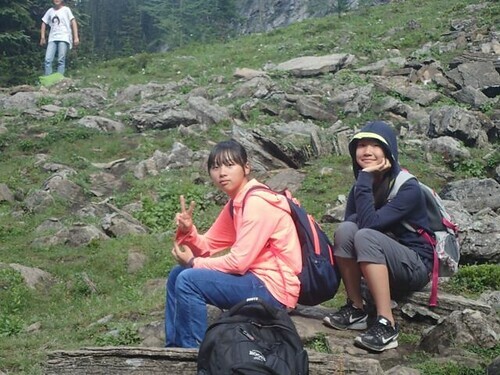 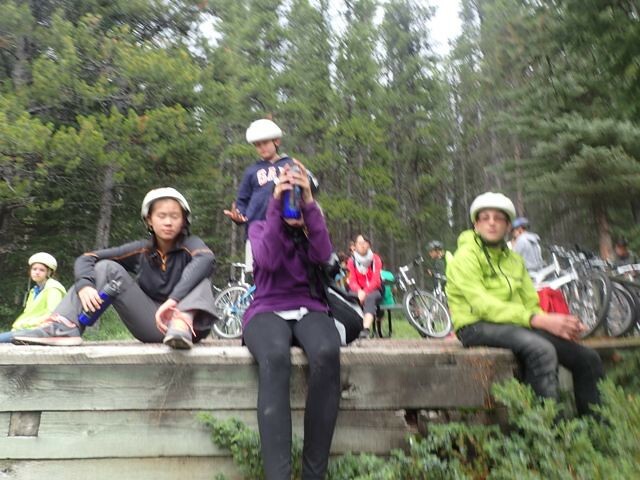 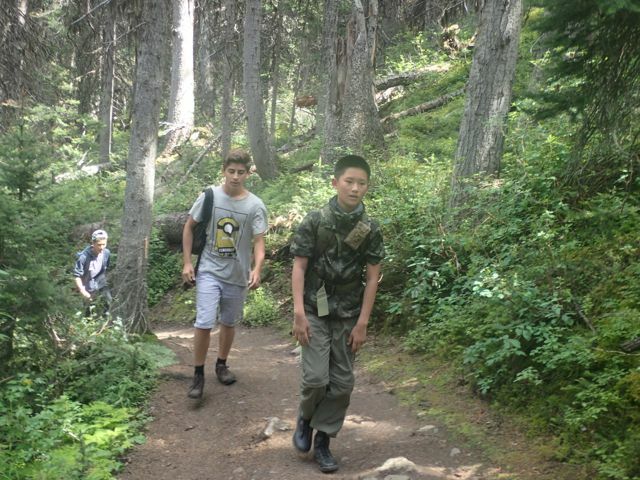 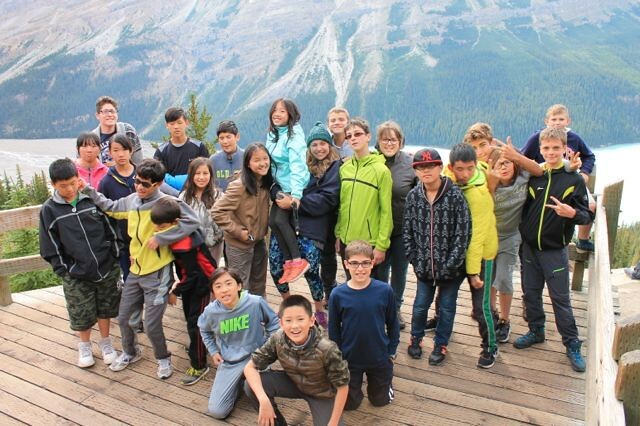 The second group took a different trail to a scenic lookout where we rested and enjoyed the majestic mountain view. 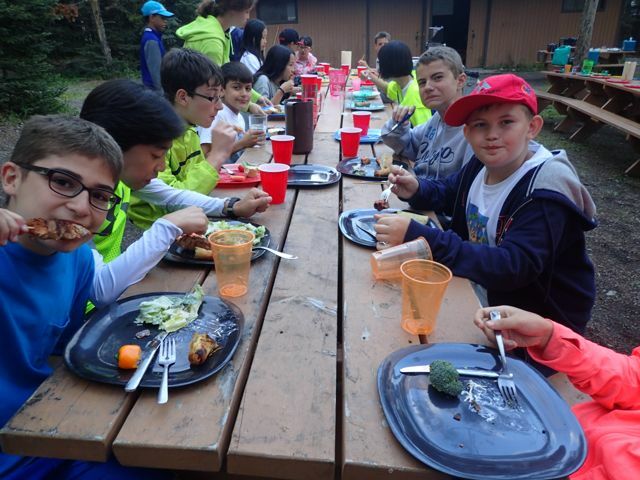 After a long day of rigorous biking we cooked up a Canadian favourite – cornmeal back bacon with noodles in a cream of mushroom sauce, and salad. 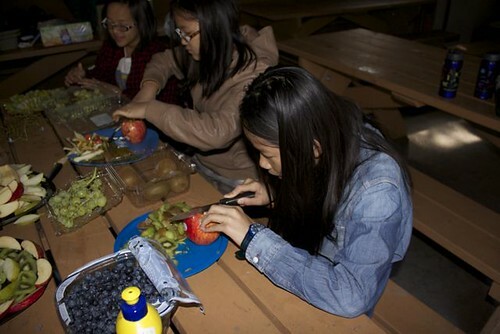 Brownies and fruit made a delectable desert! 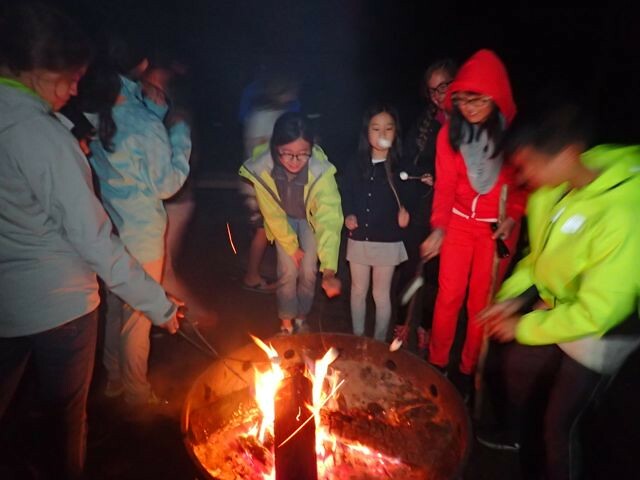 We sung songs around the campfire and enjoyed a camping must-have: smores!! 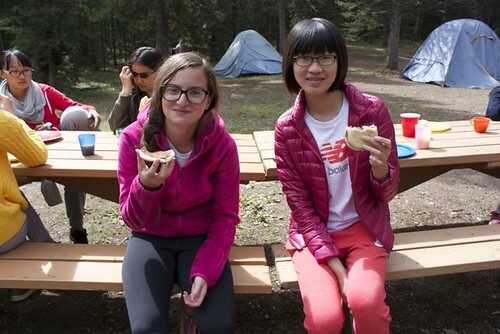 On Wednesday morning we got up bright and early and quickly ate a breakfast of croissants and yogurt so we could leave at 9am to go on our day’s activities. 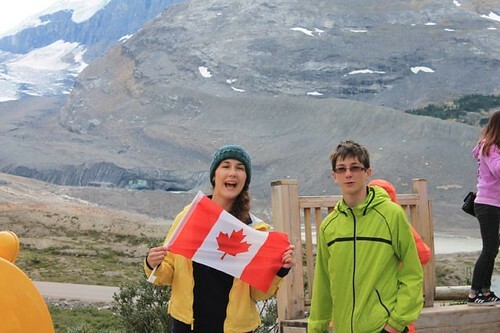 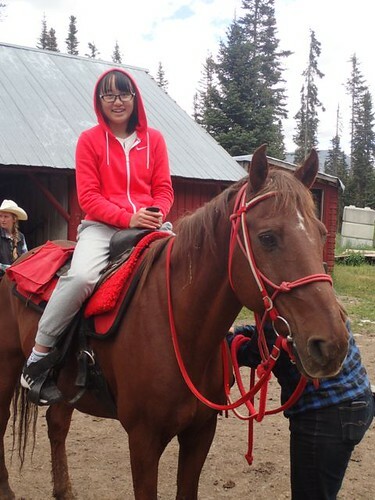 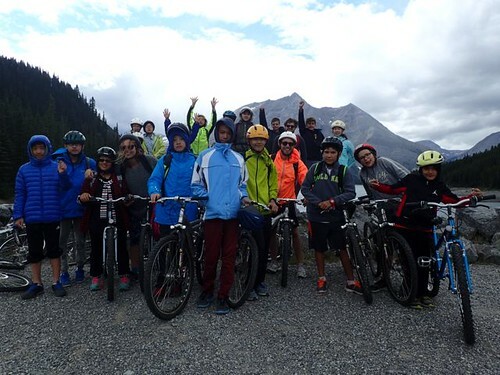 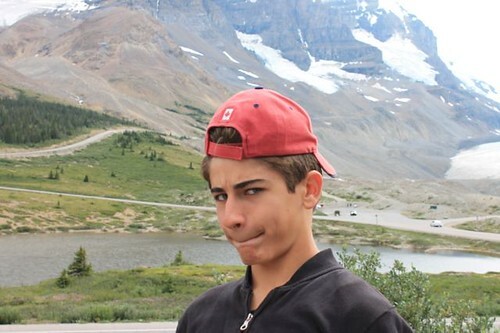 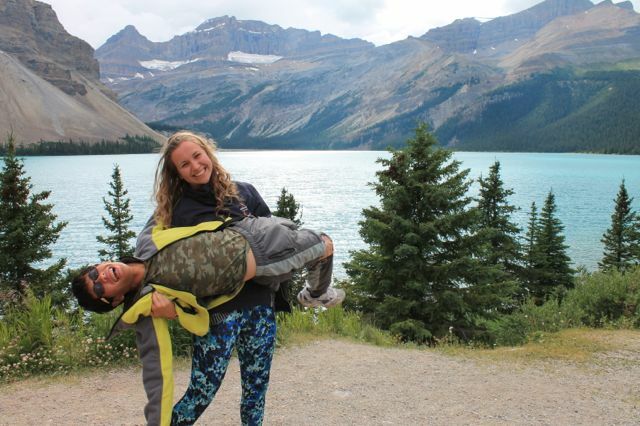 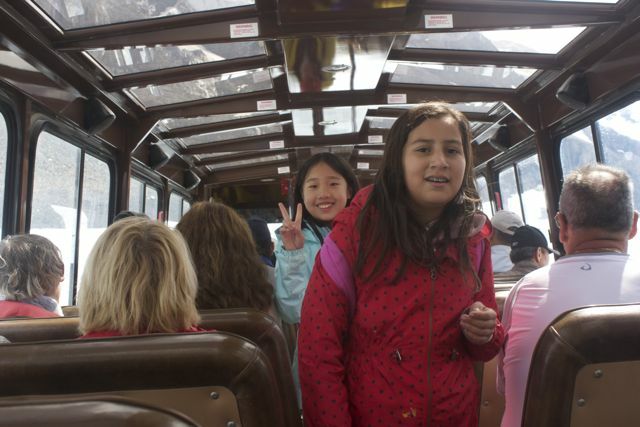 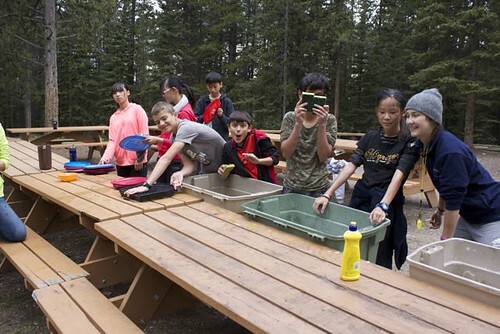 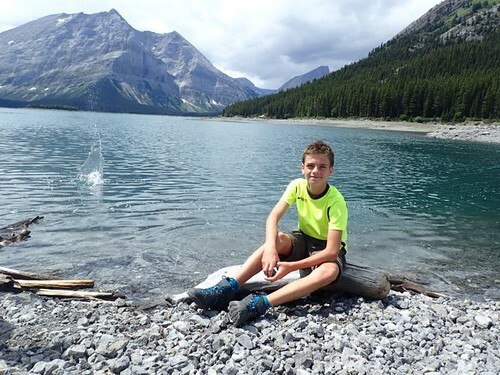 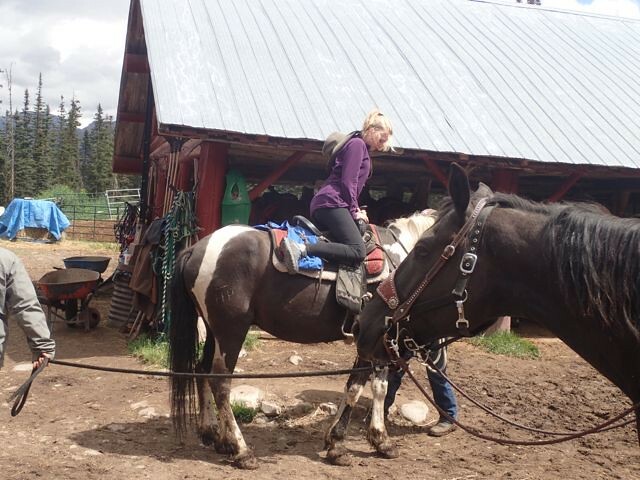 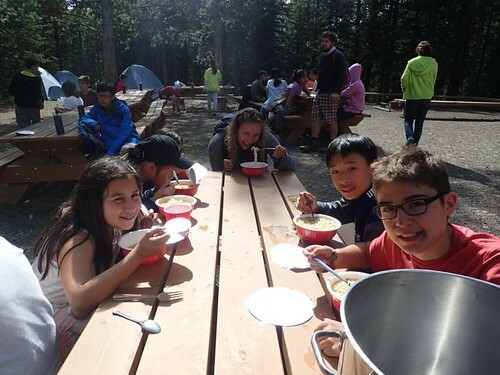 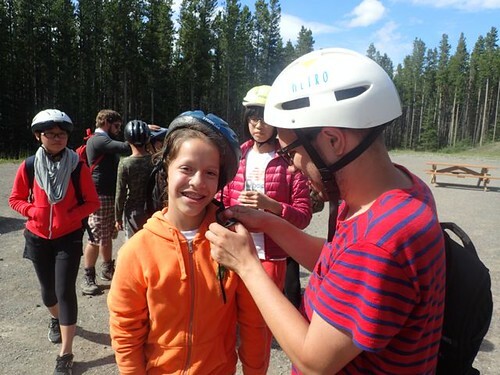 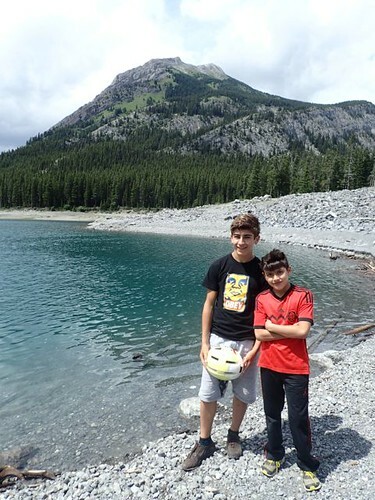 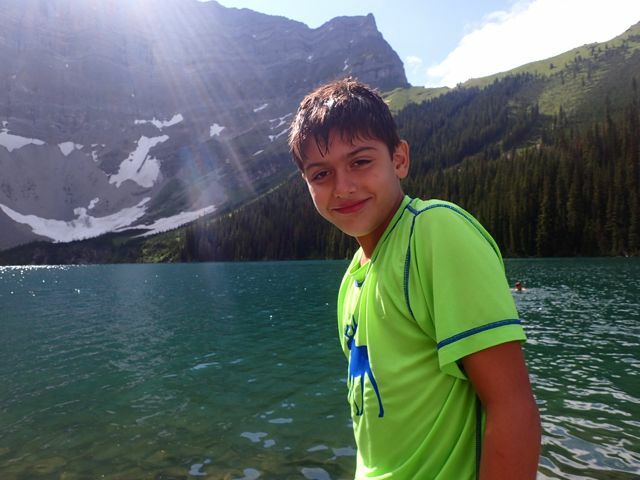 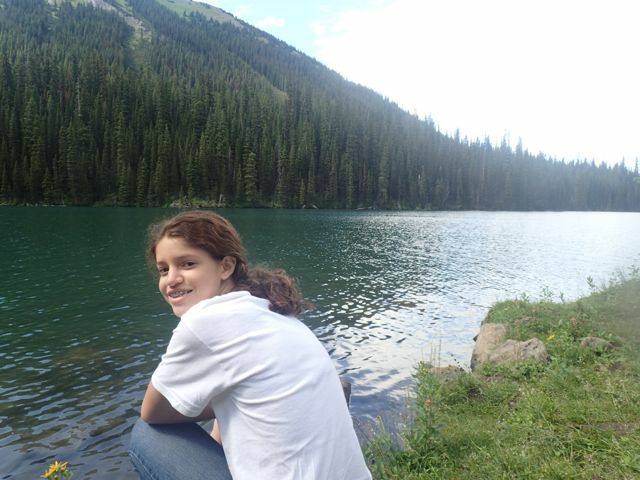 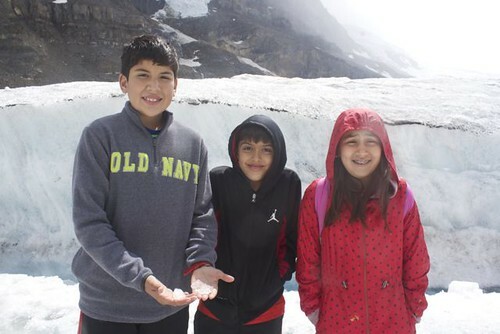 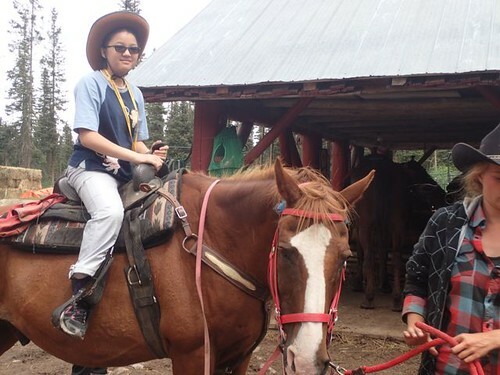 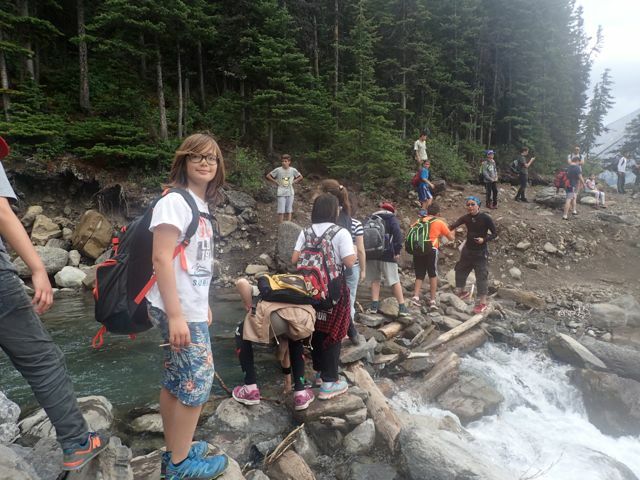 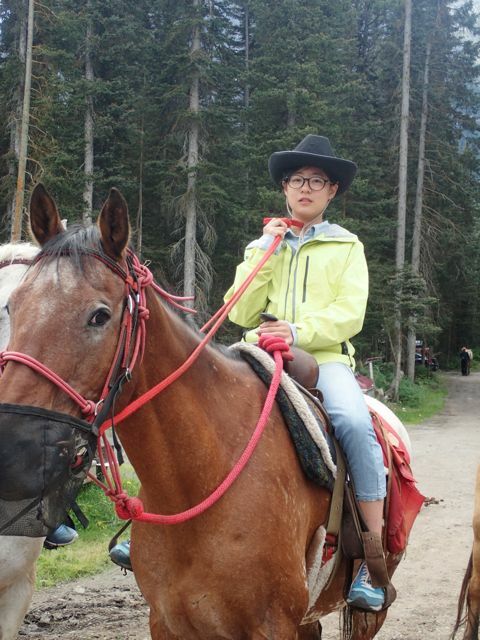 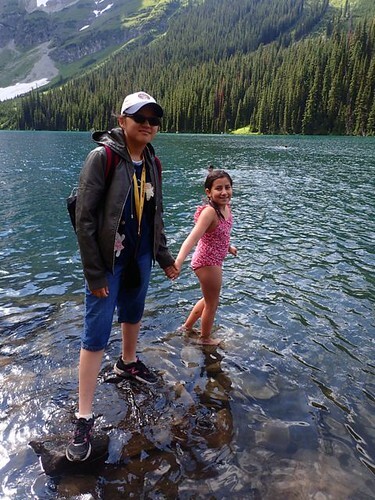 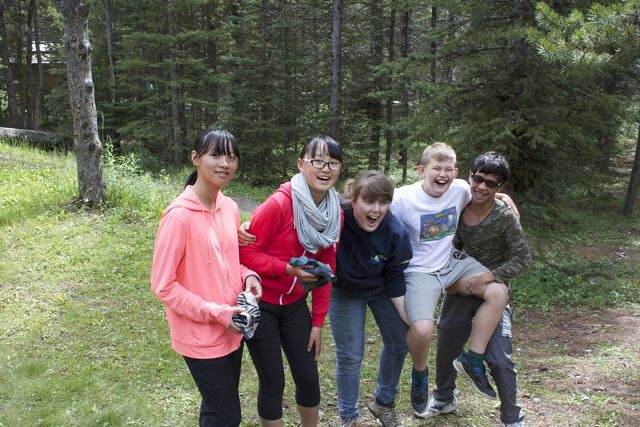 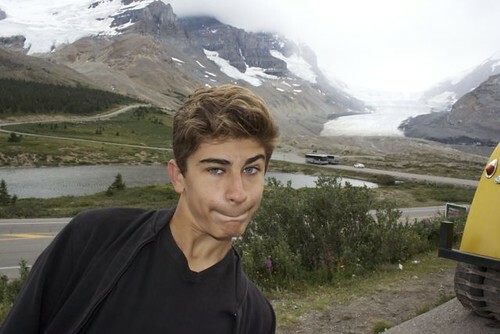 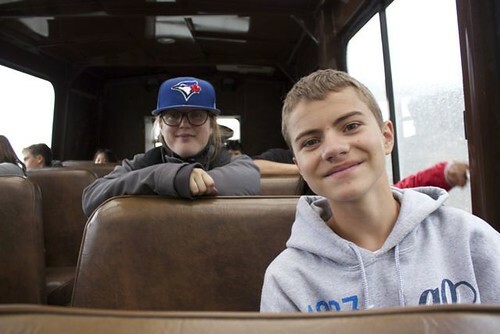 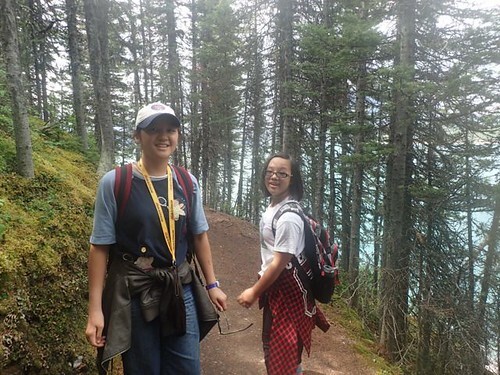 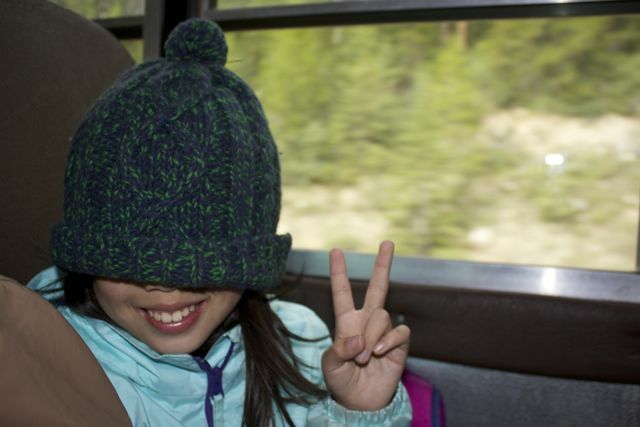 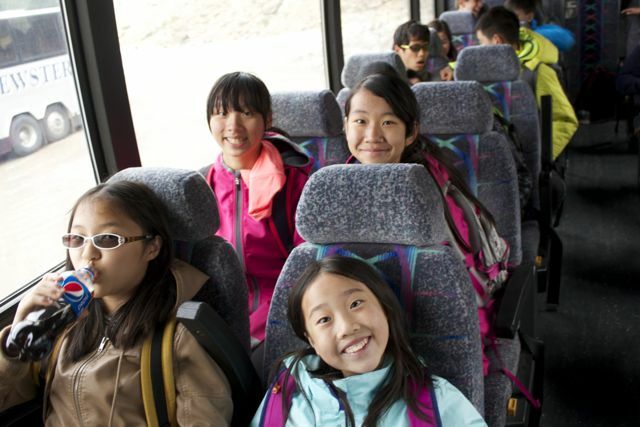 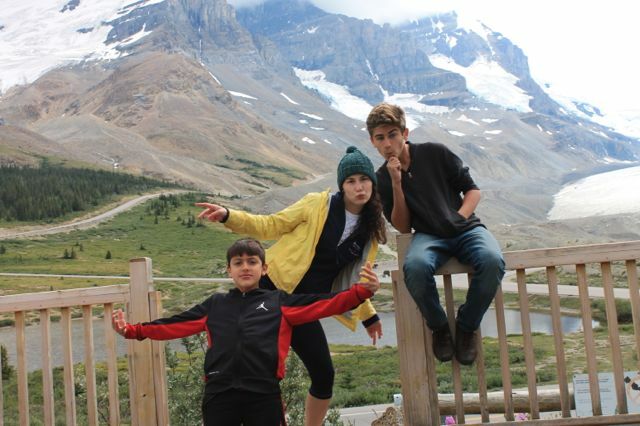 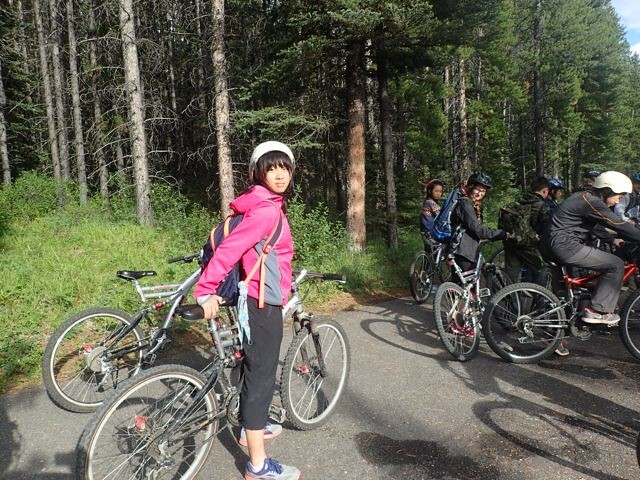 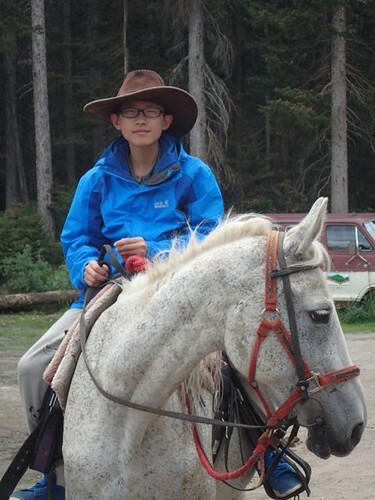 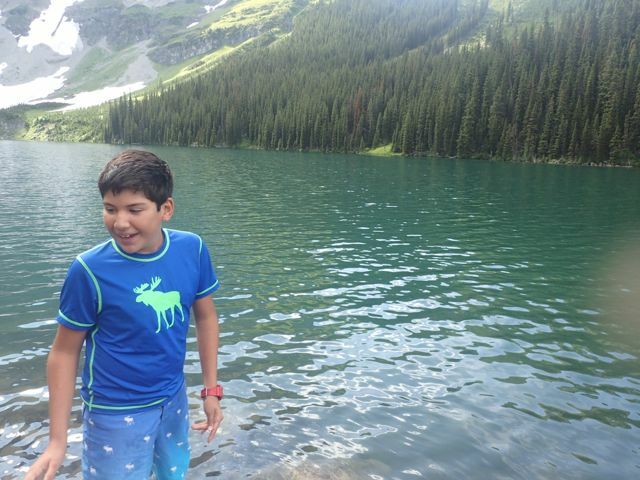 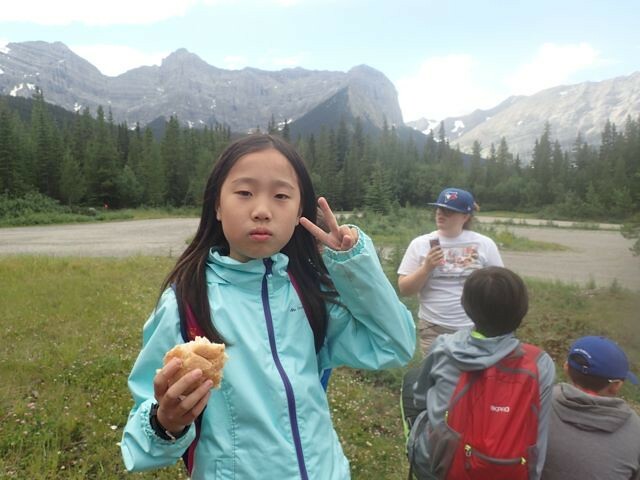 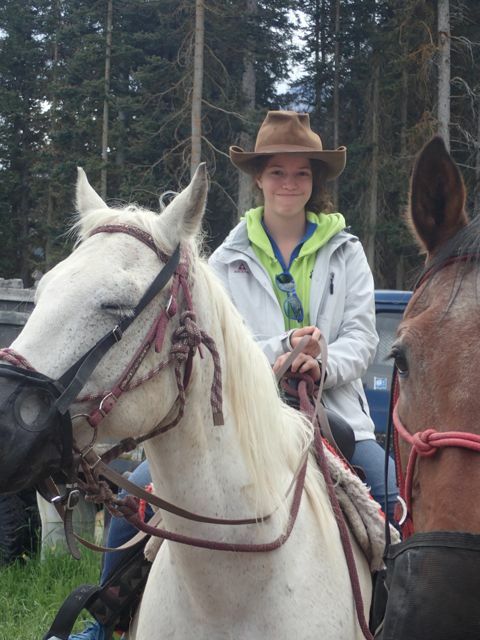 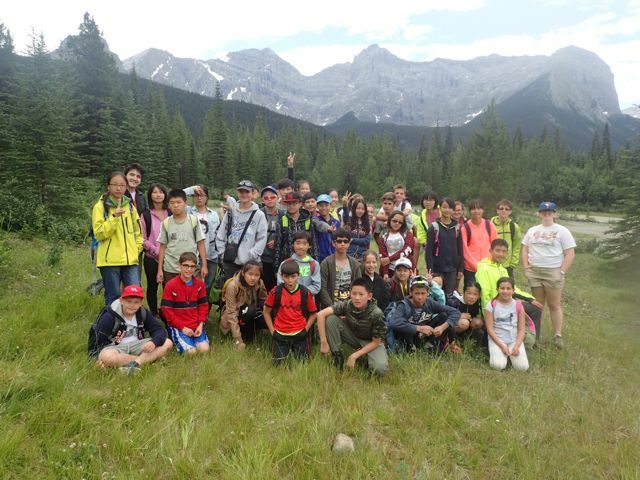 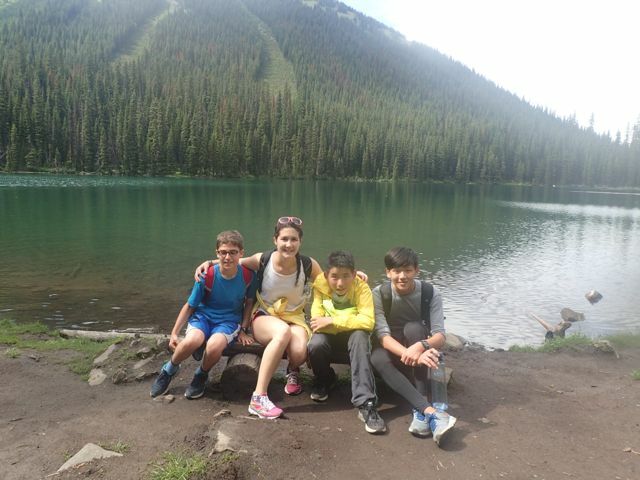 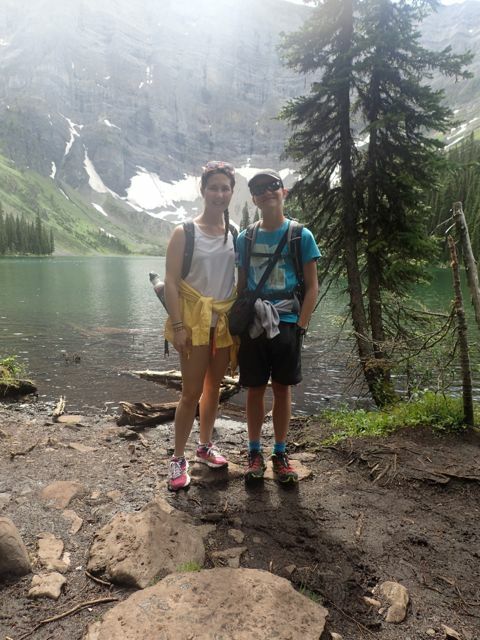 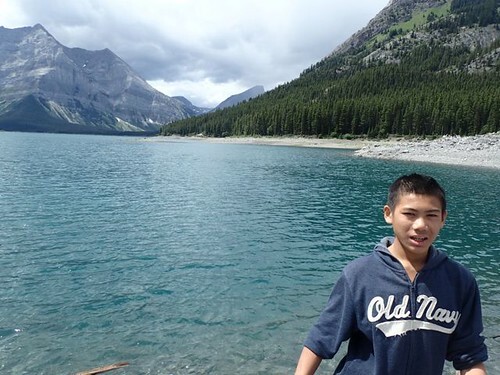 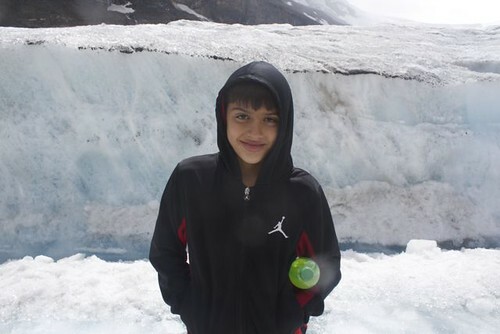 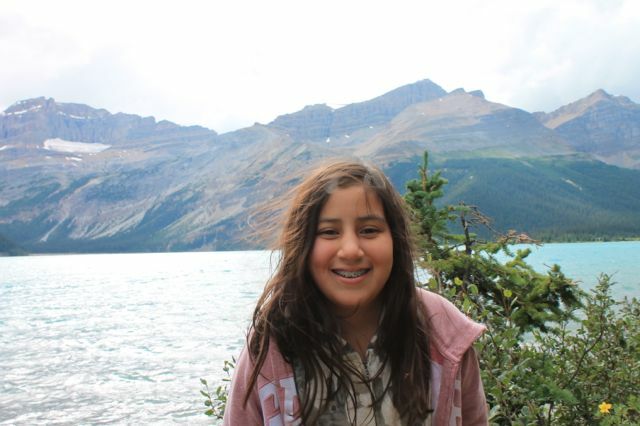 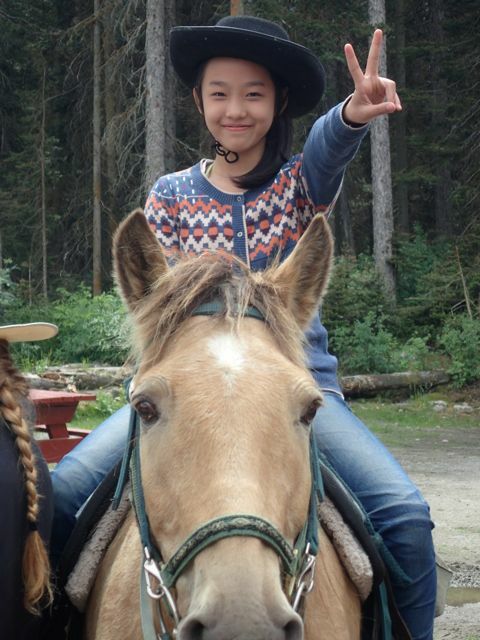 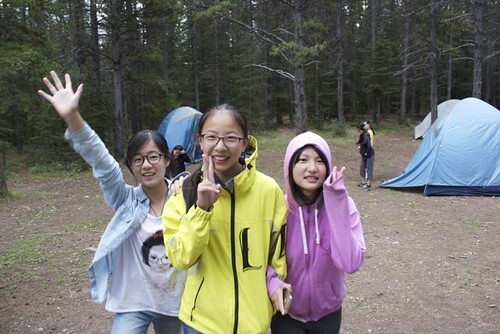 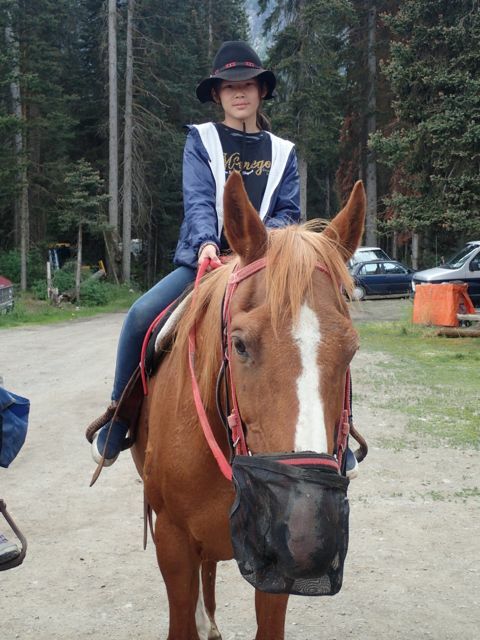 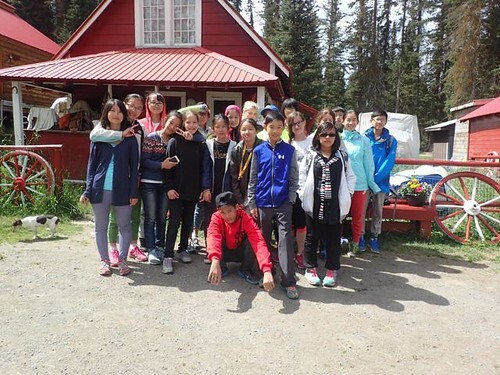 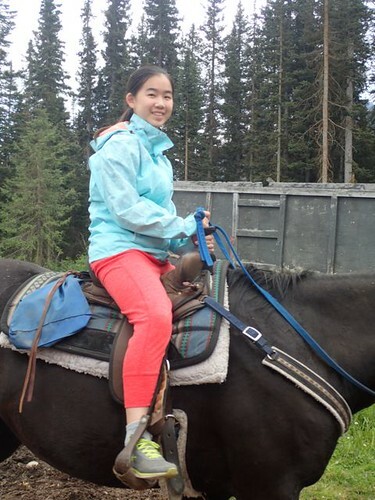 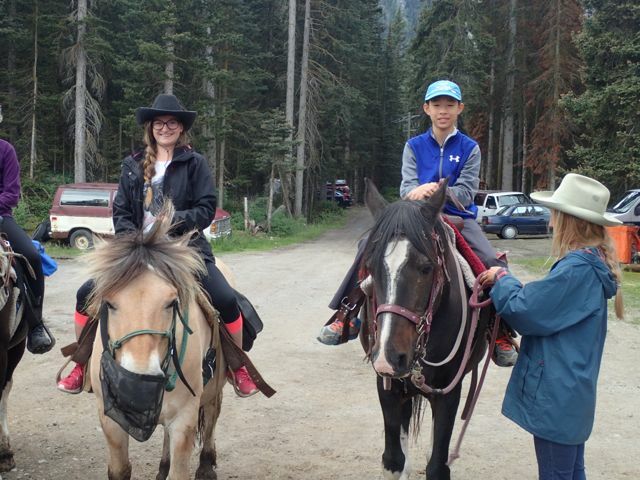 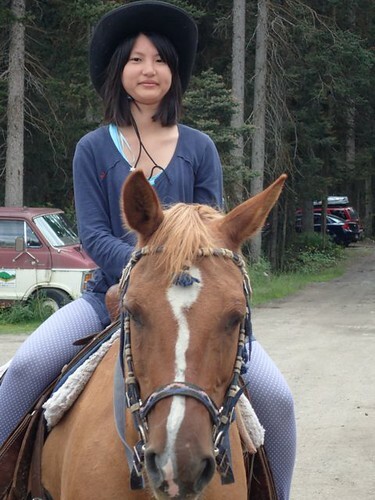 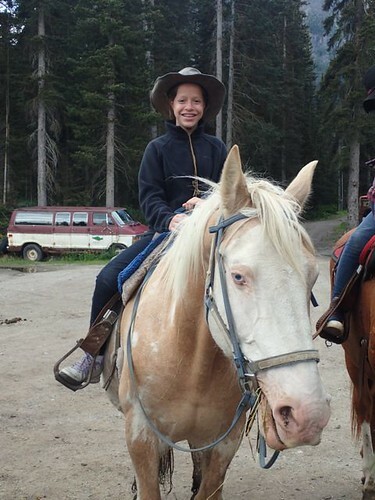 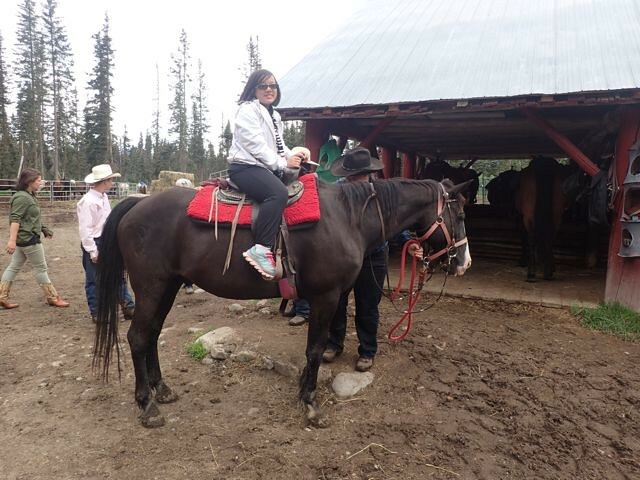 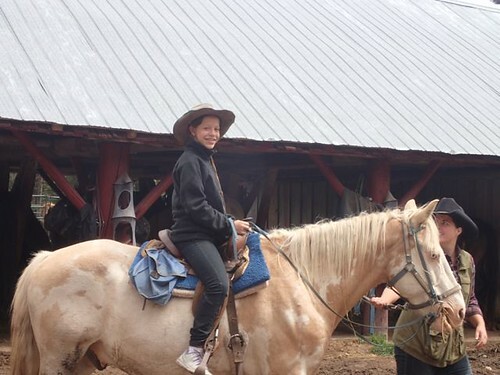 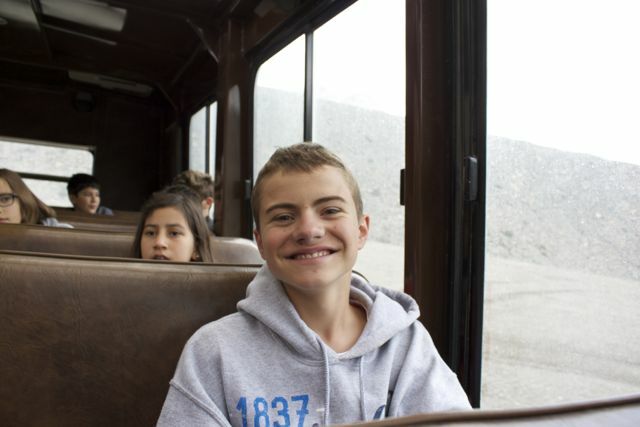 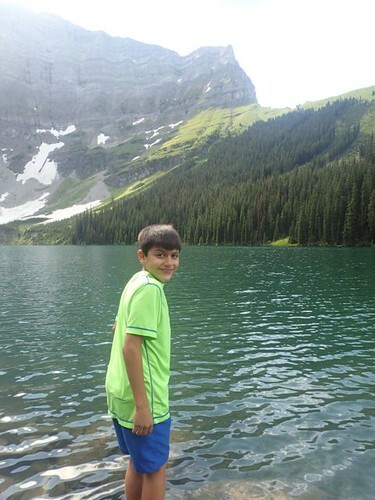 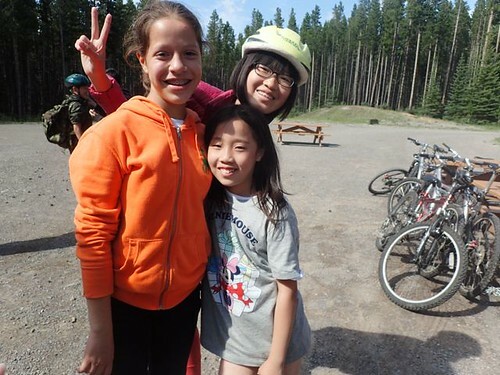 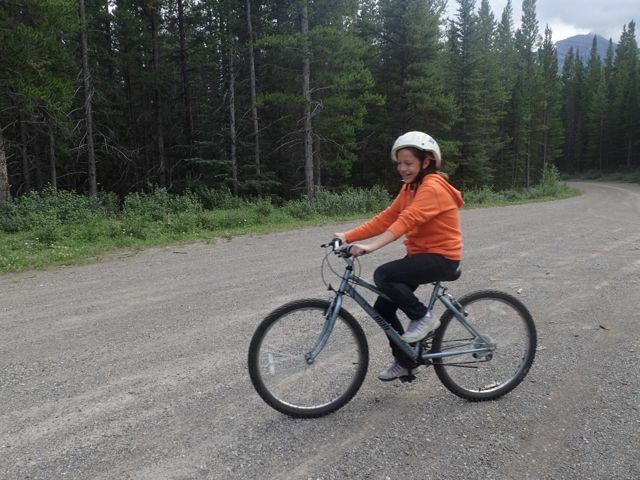 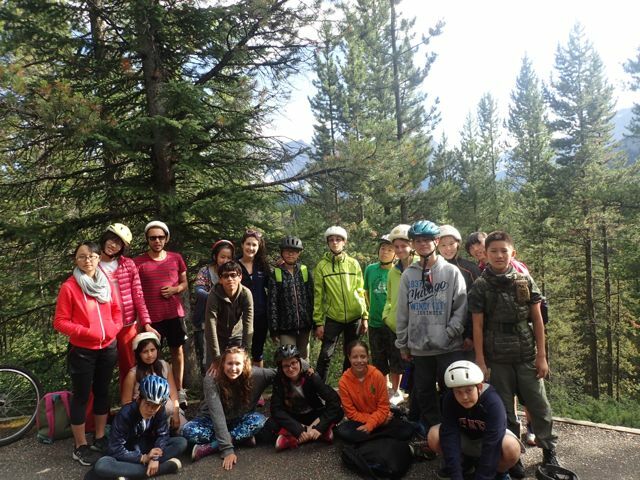 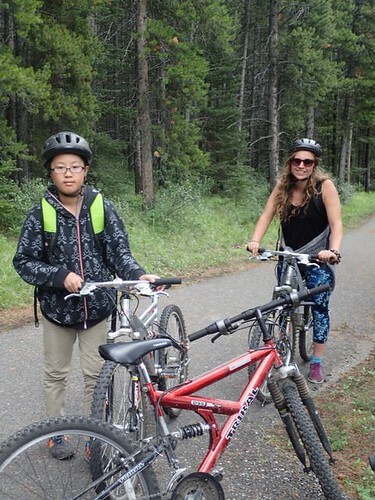 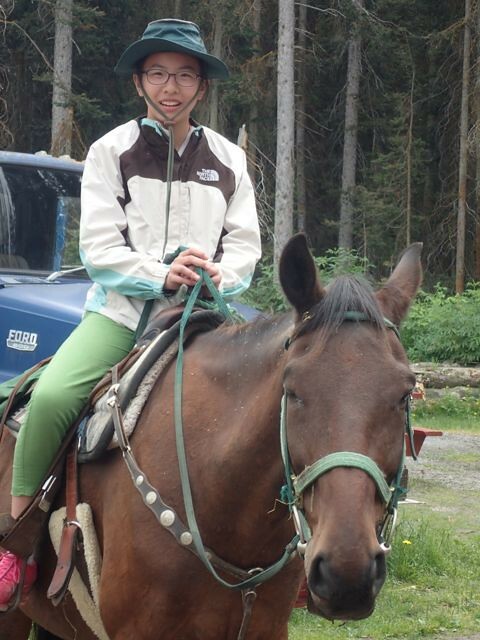 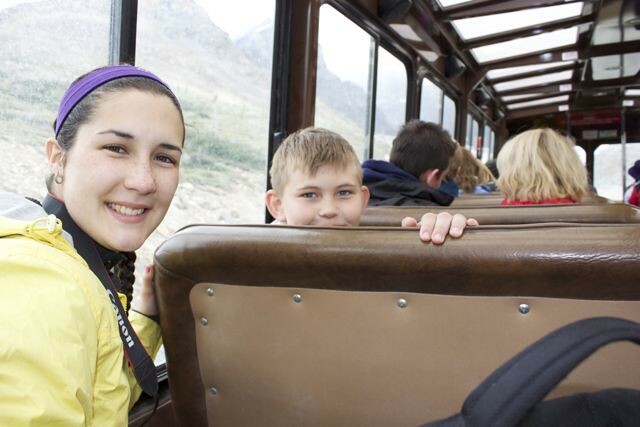 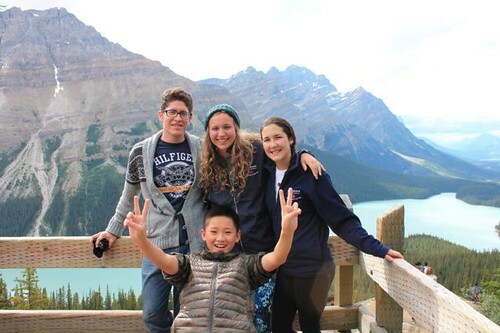 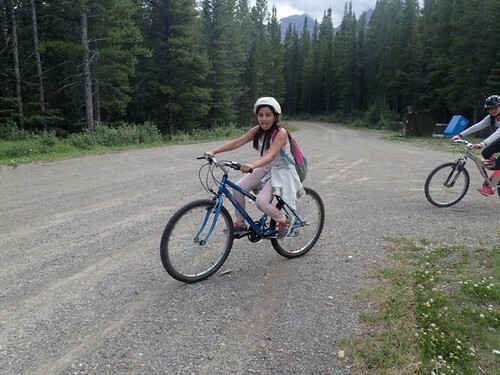 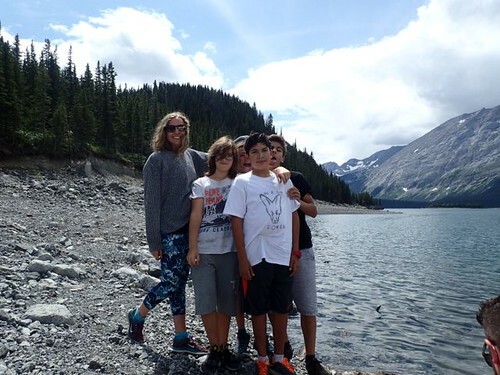 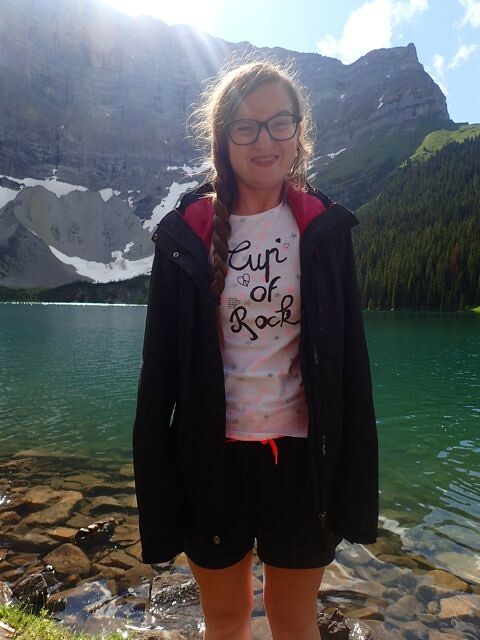 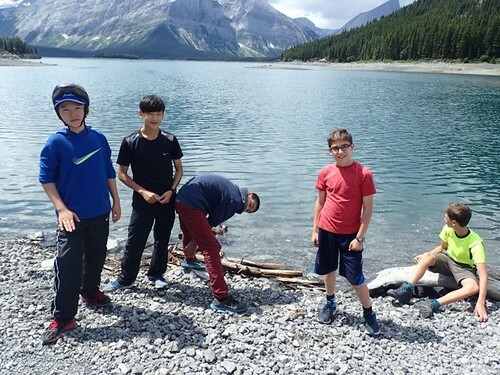 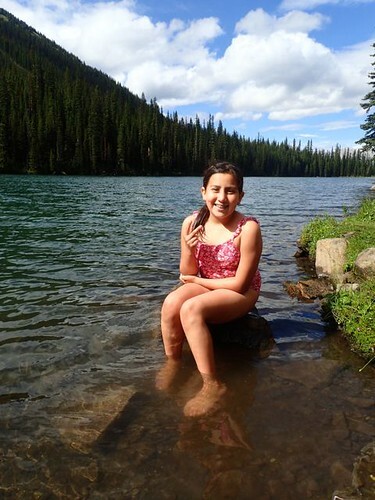 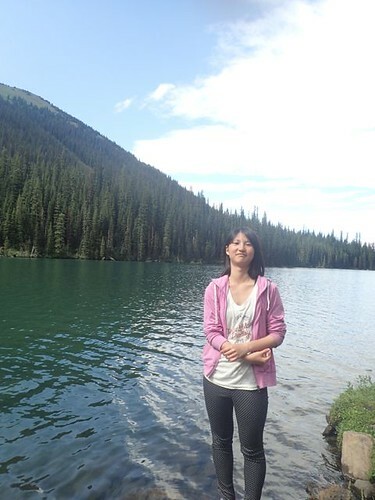 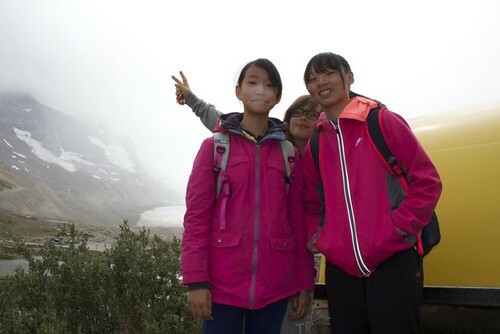 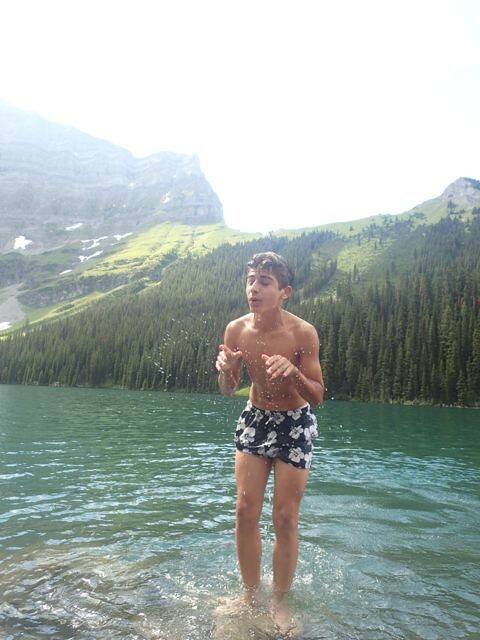 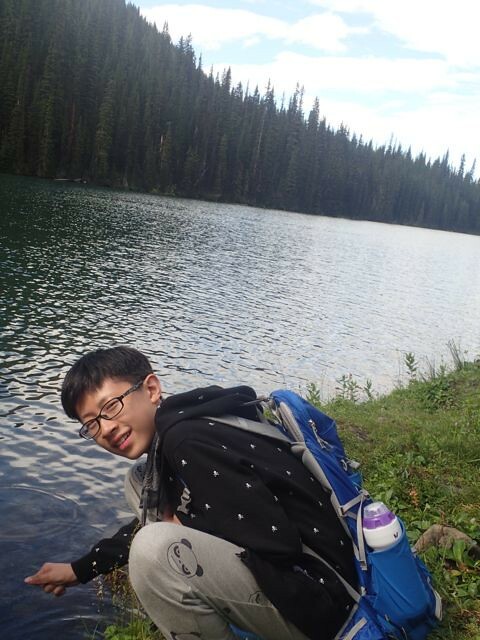 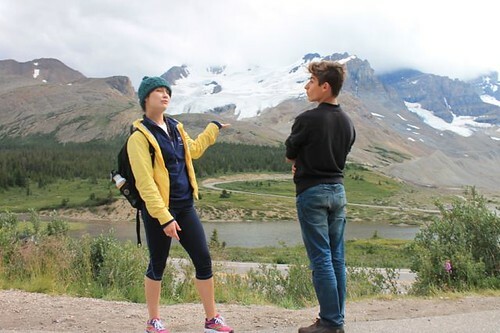 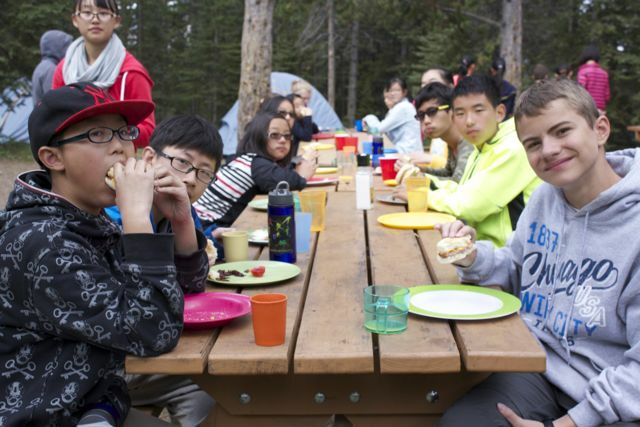 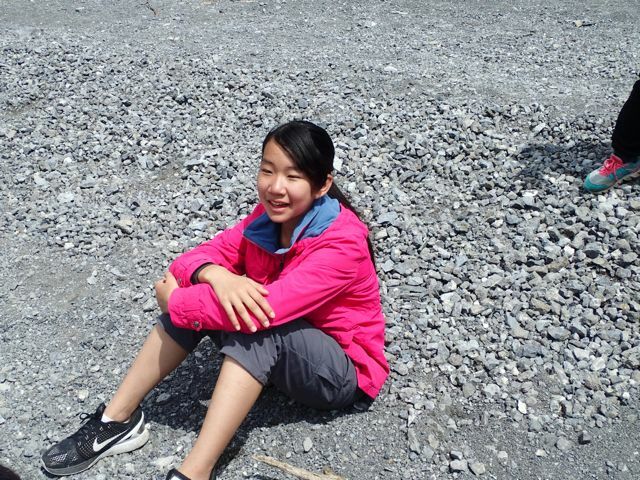 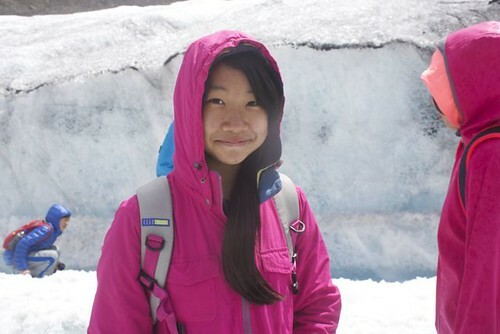 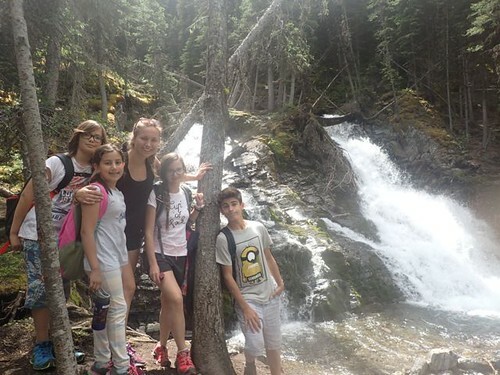 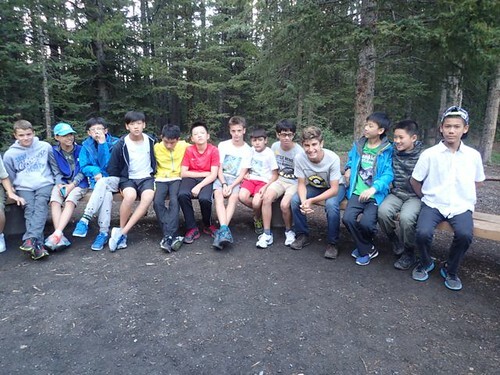 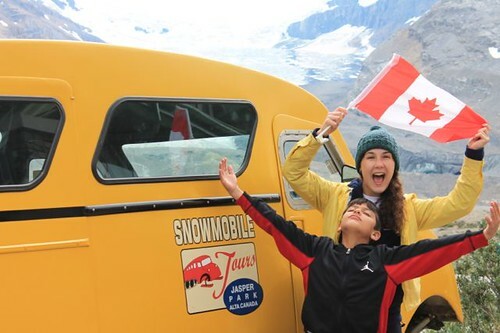 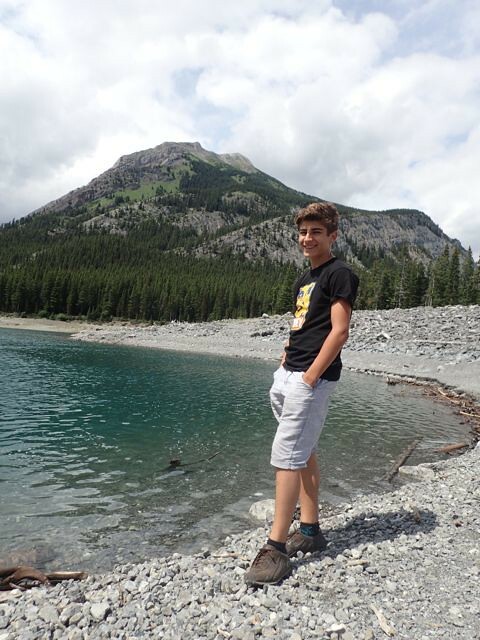 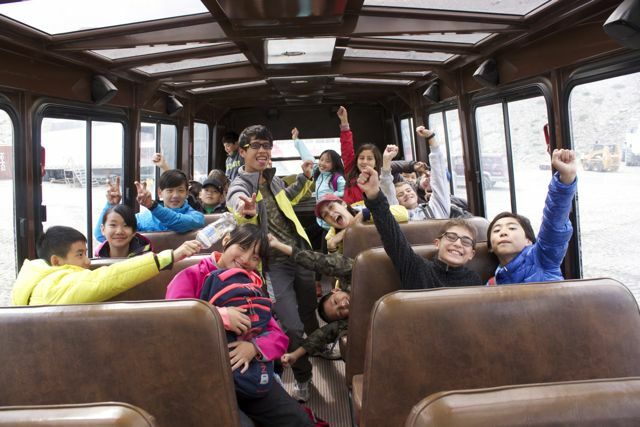 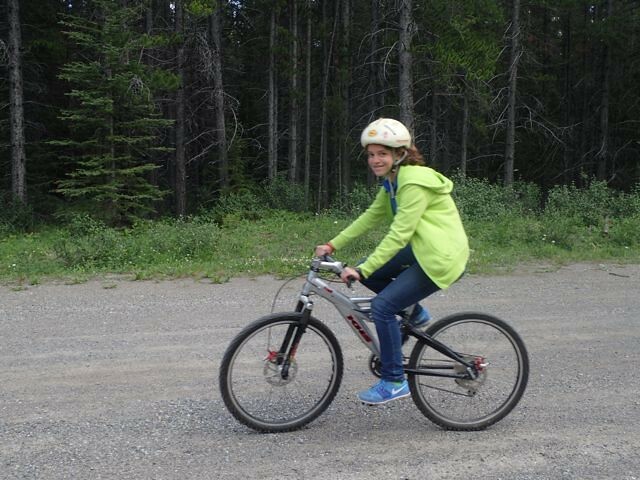 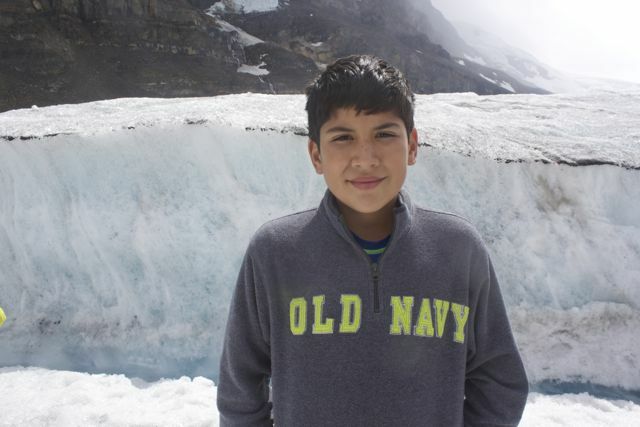 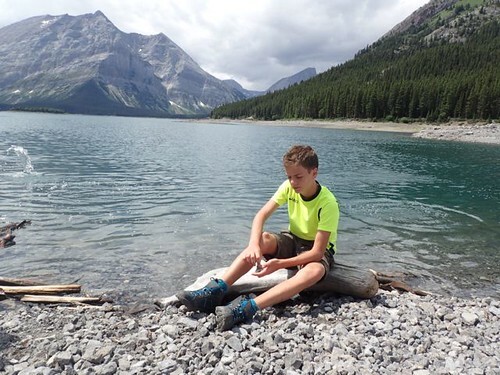 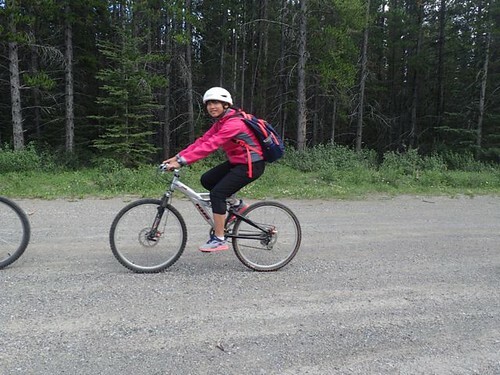 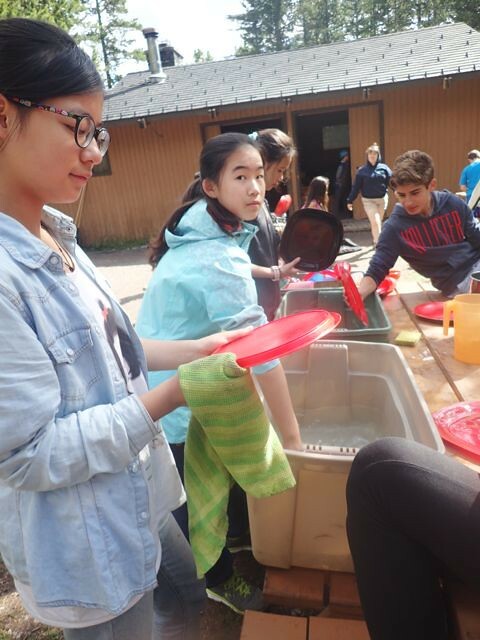 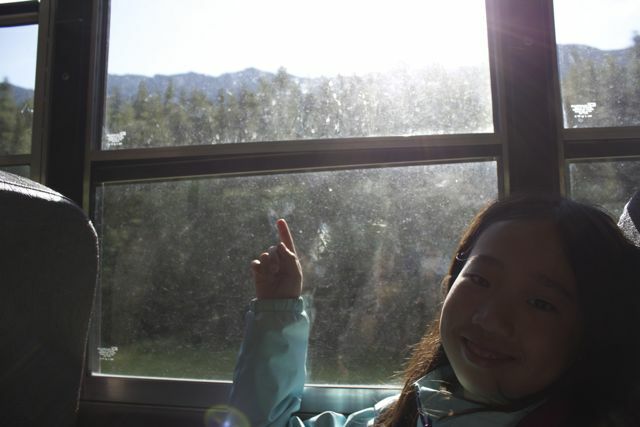 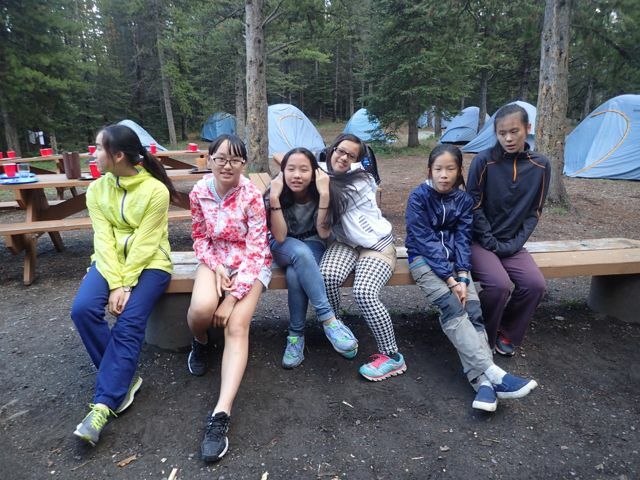 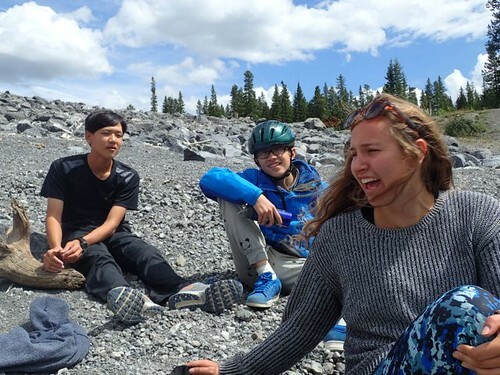 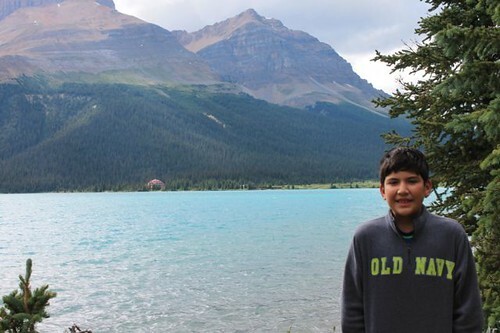 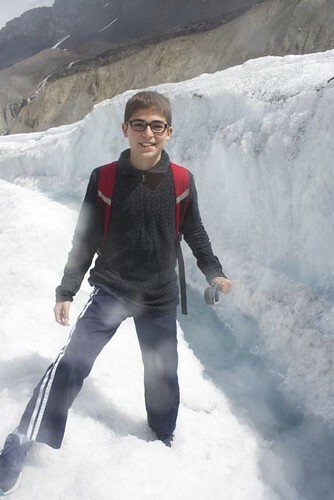 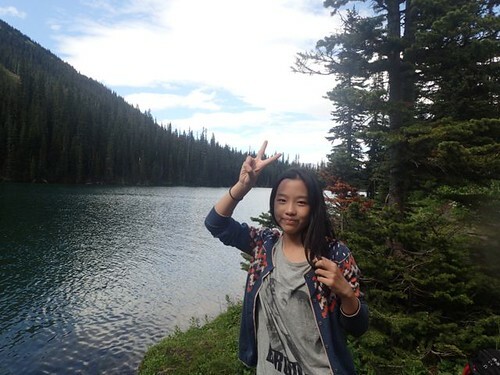 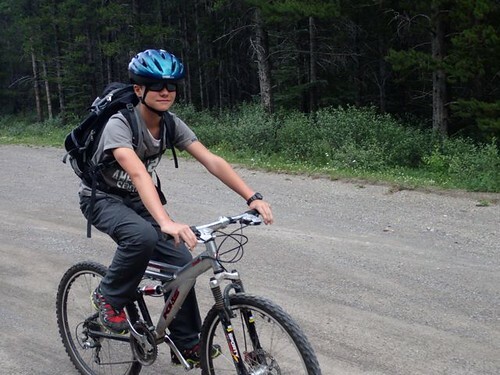 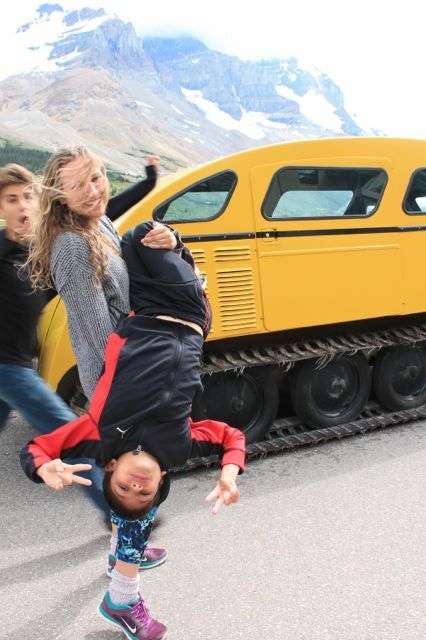 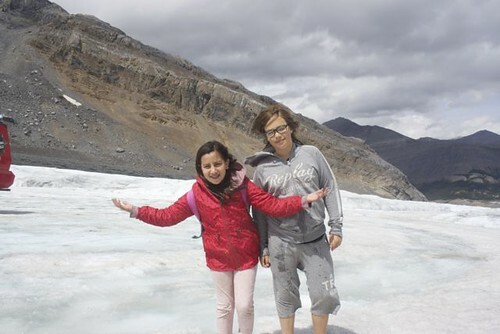 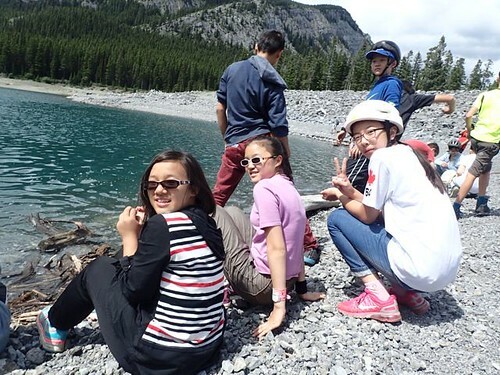 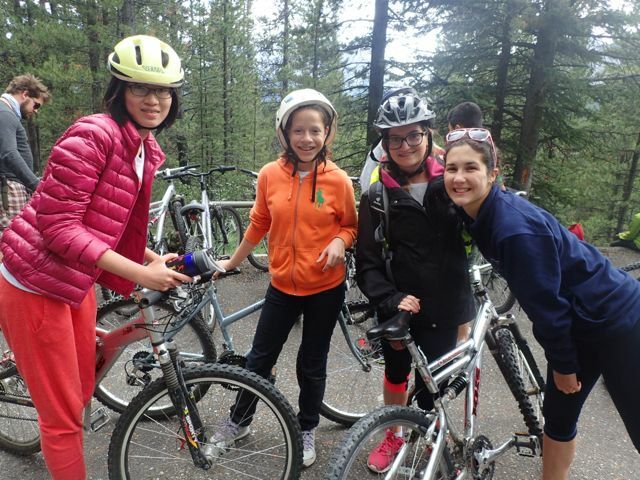 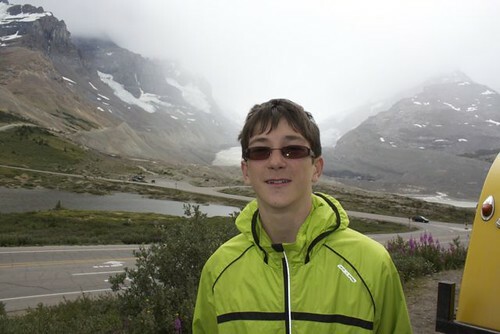 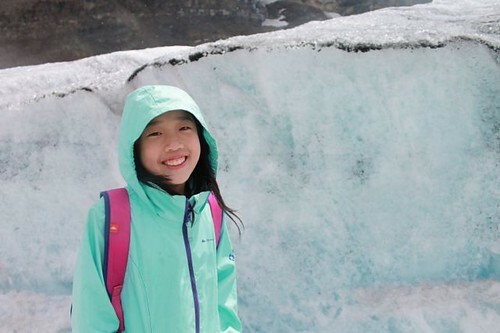 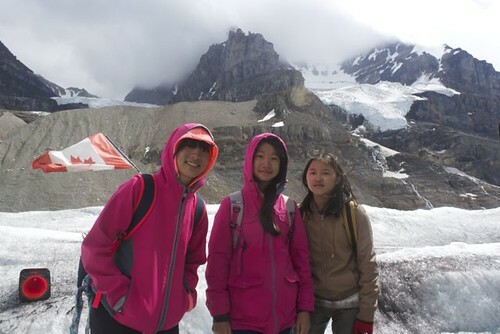 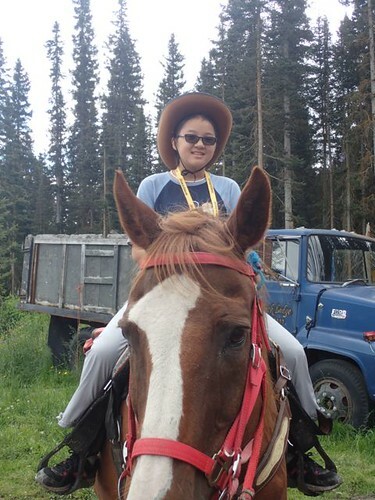 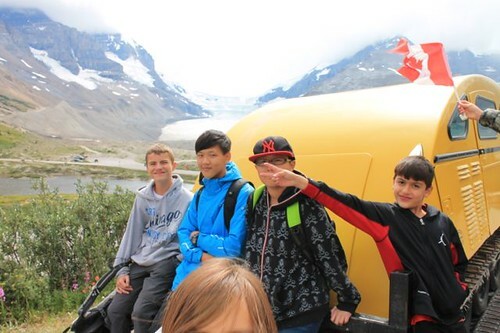 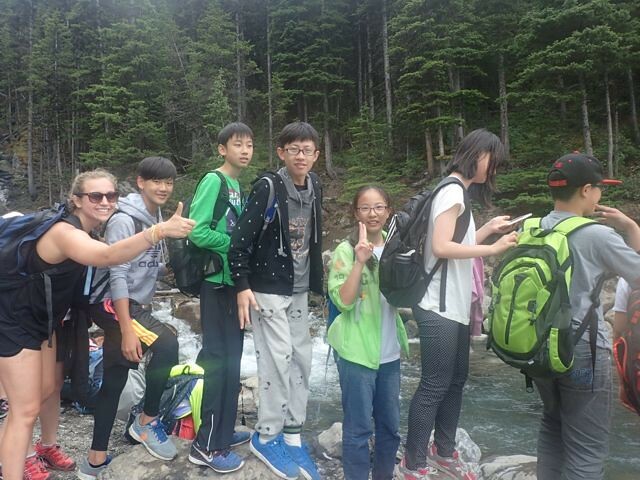 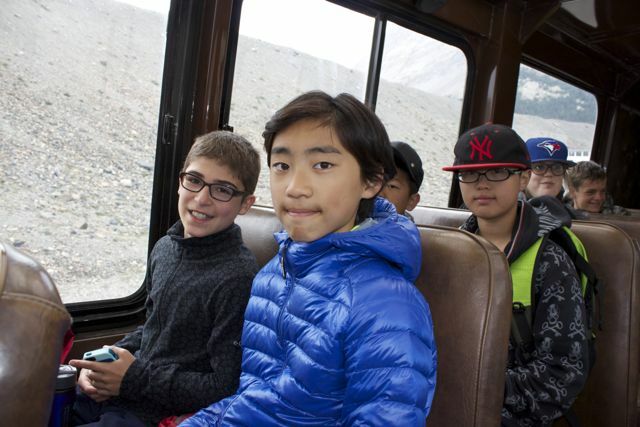 Half of the students went to Lake Louise National Park to go horseback riding around the iconic lake, while the other half continued on their bus ride to Columbia Icefields in Jasper National Park. 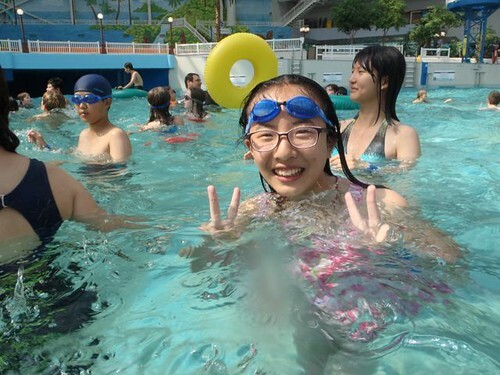 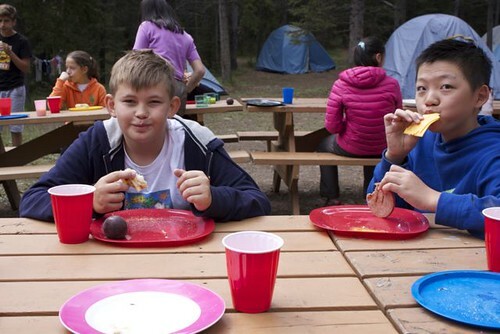 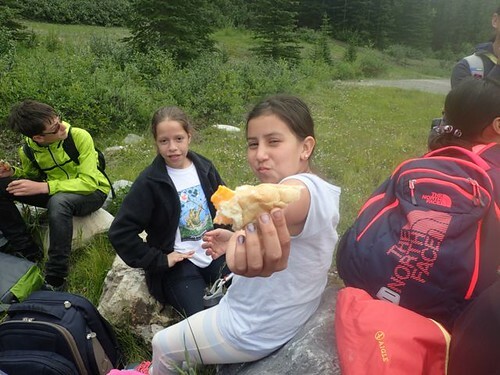 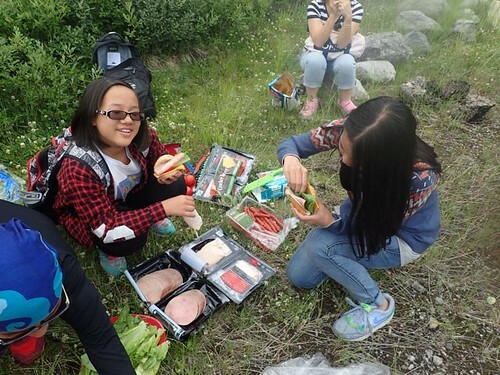 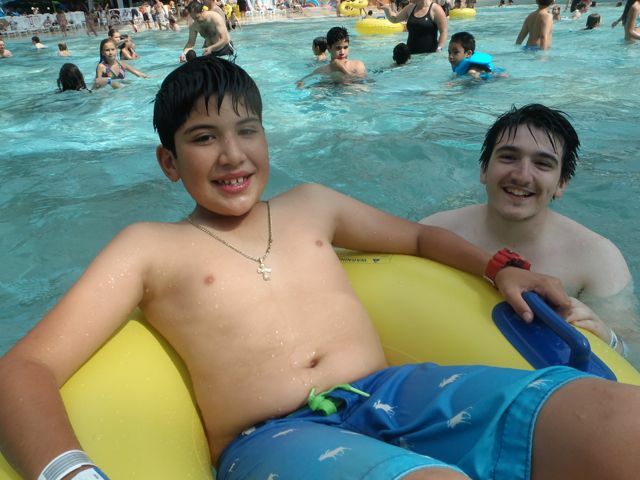 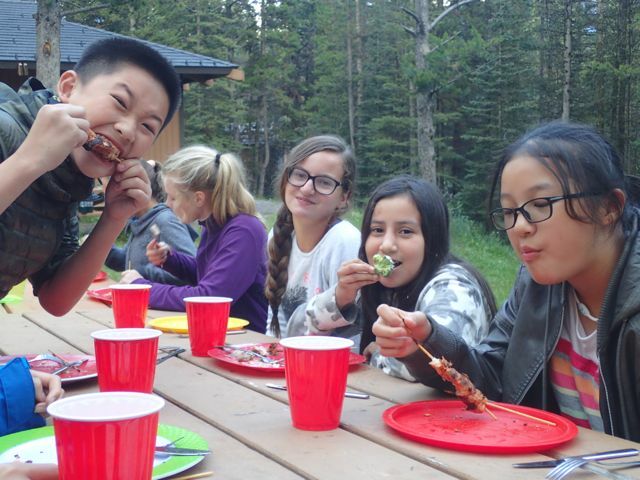 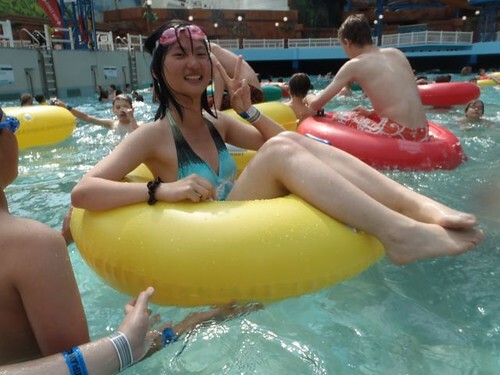 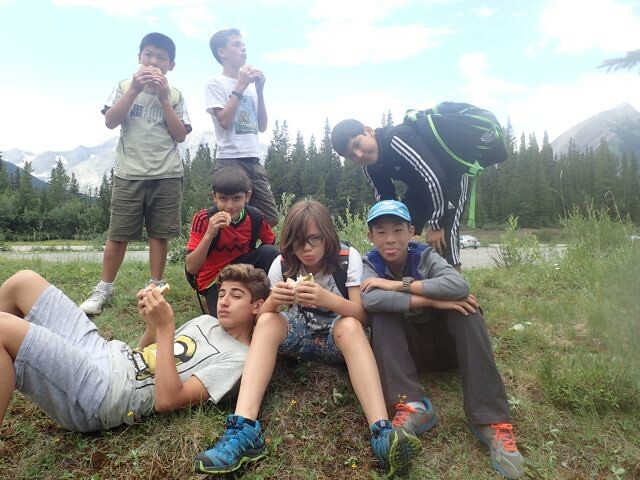 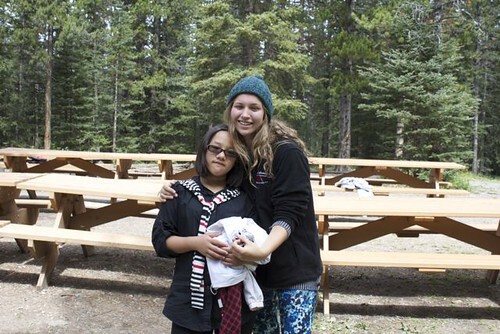 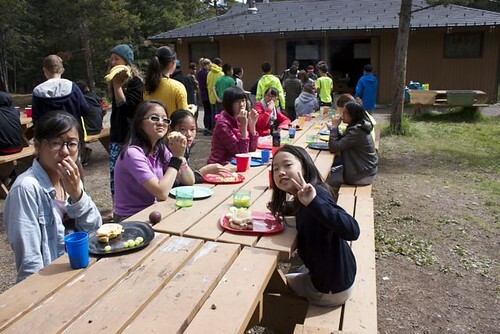 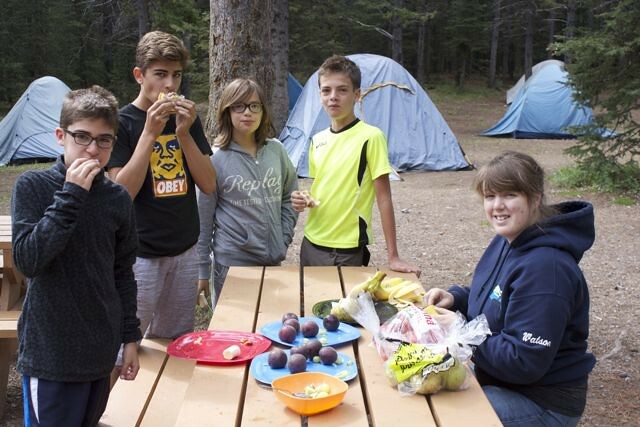 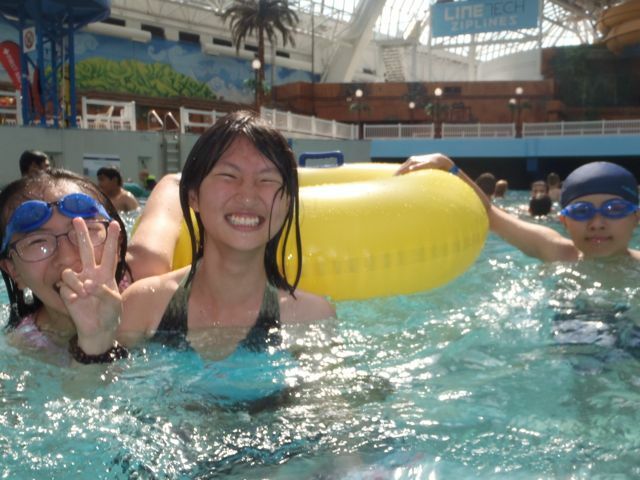 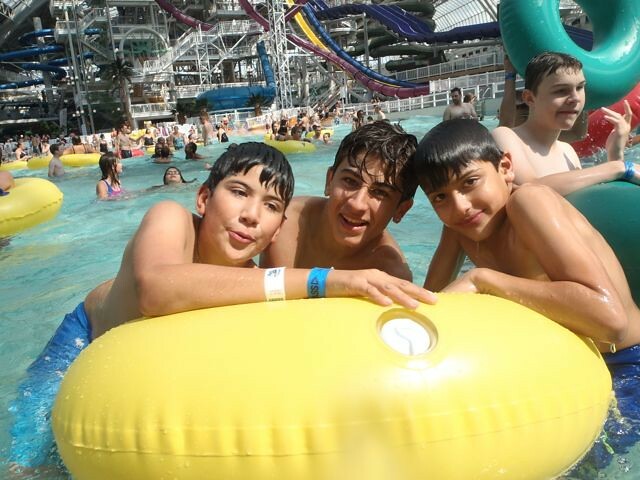 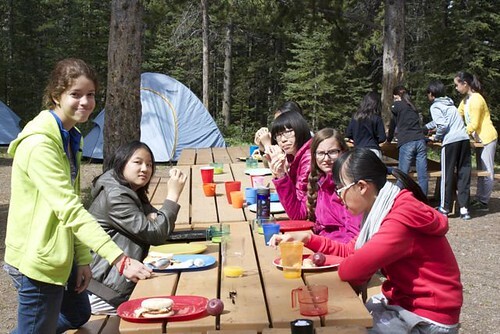 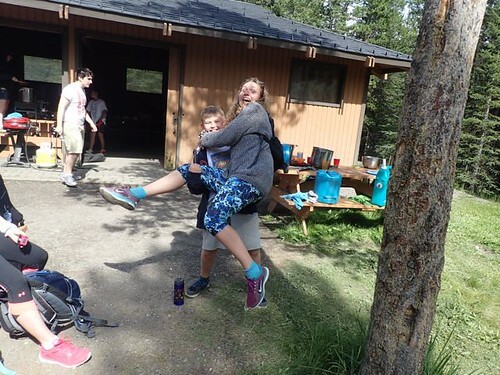 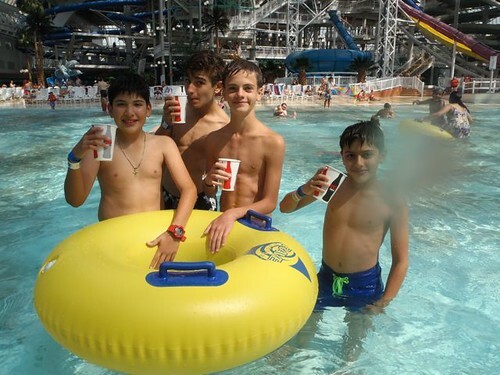 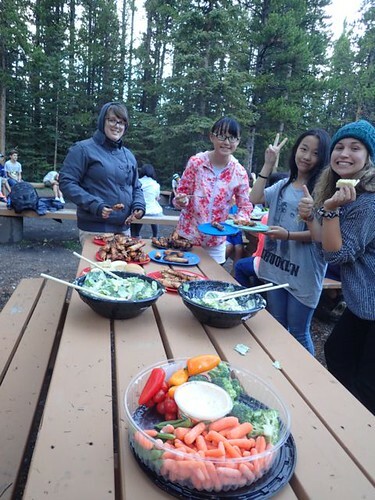 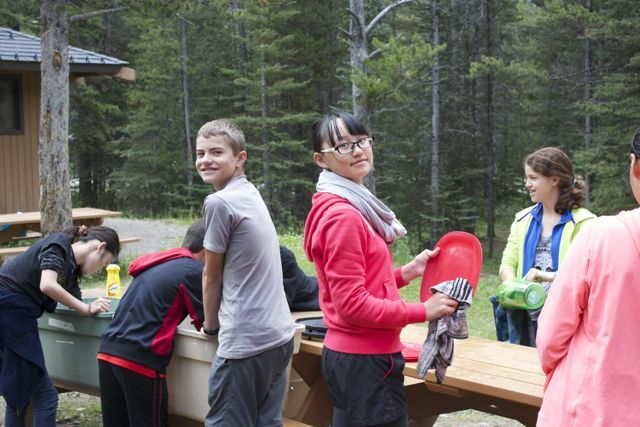 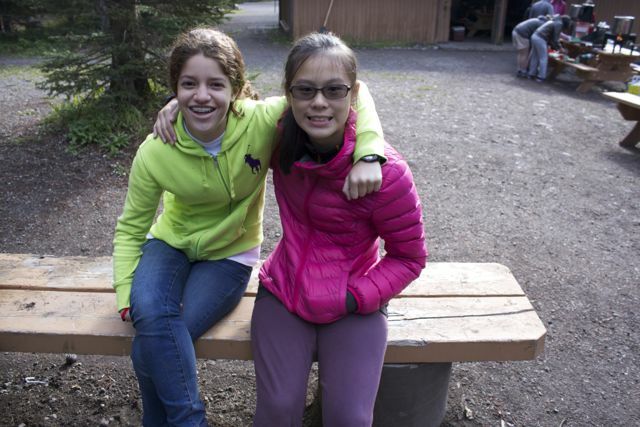 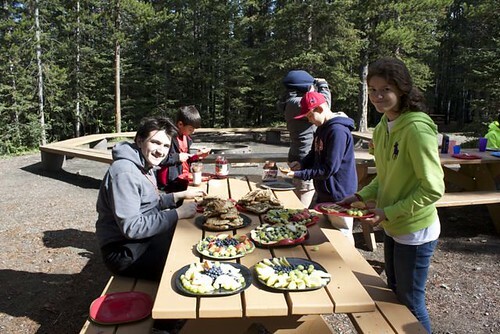 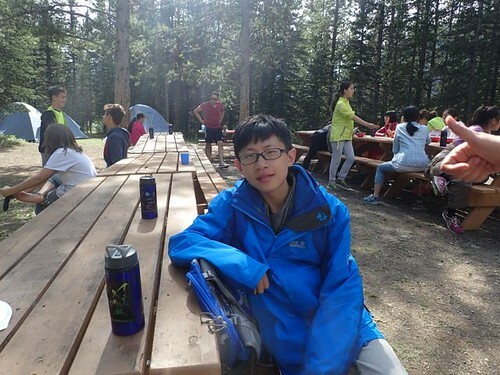 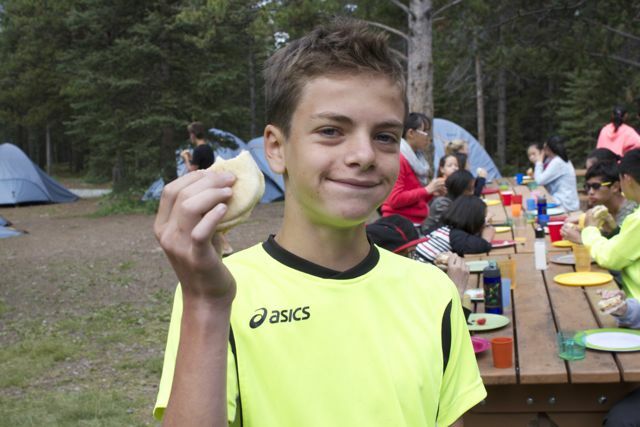 The students had a barbeque hot dog lunch and headed off to their respective activities. 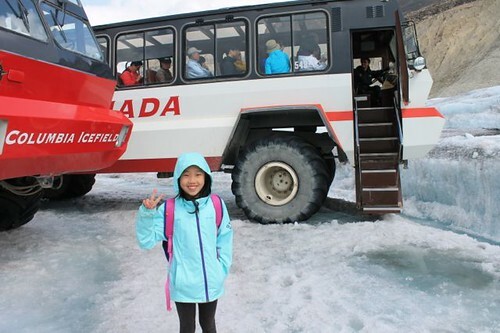 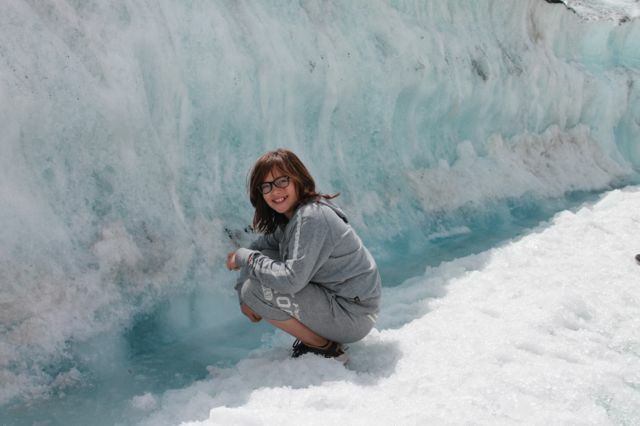 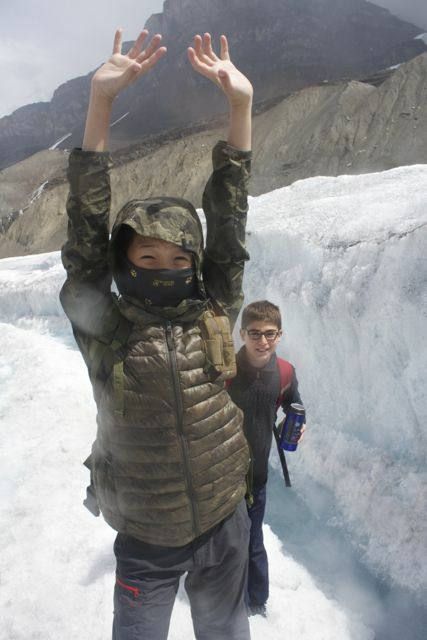 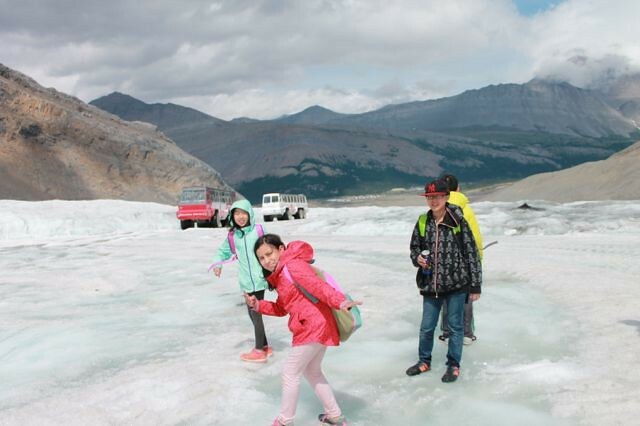 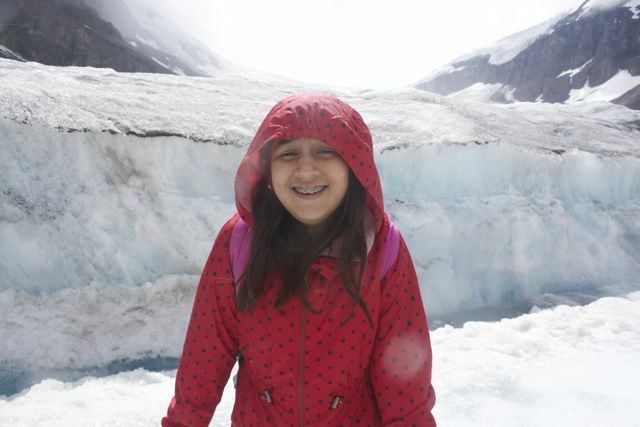 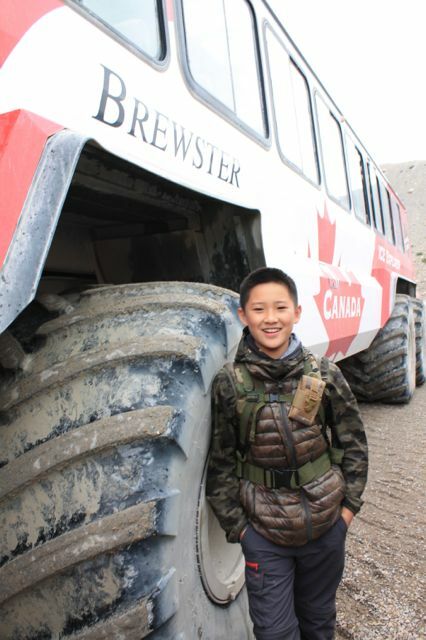 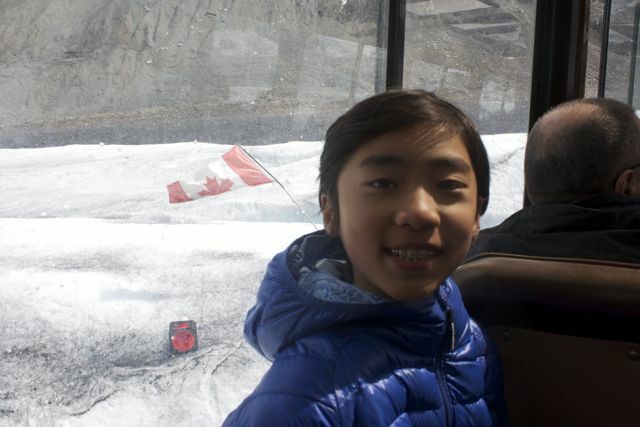 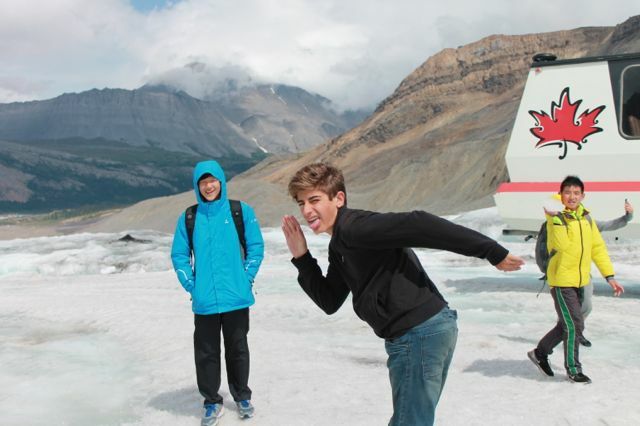 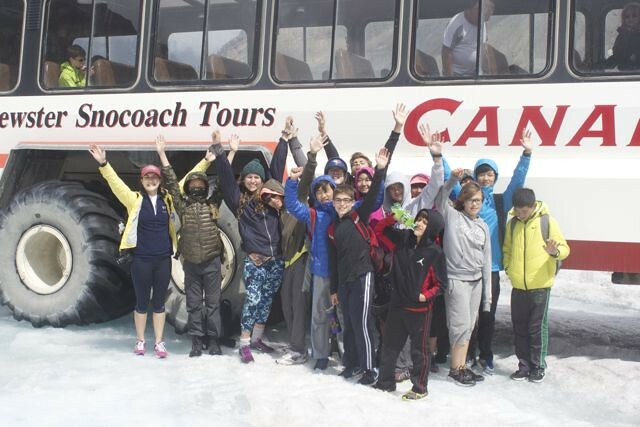 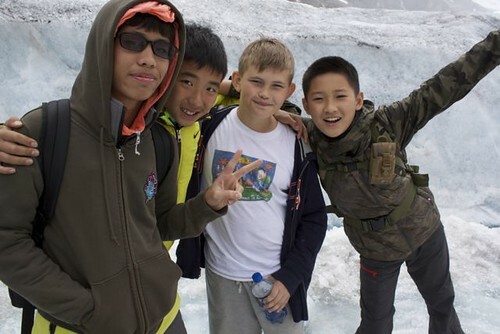 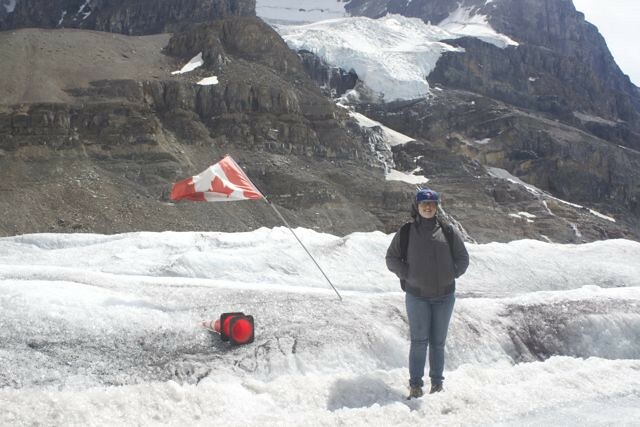 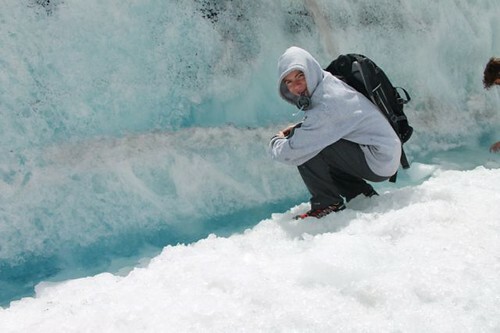 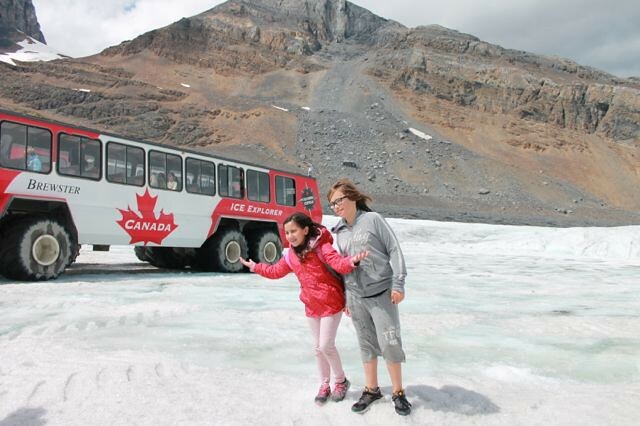 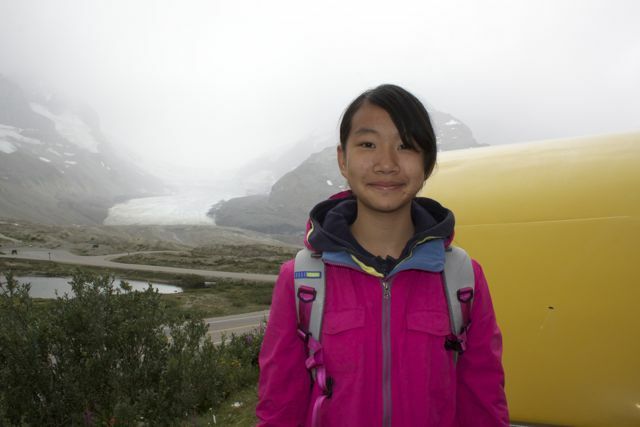 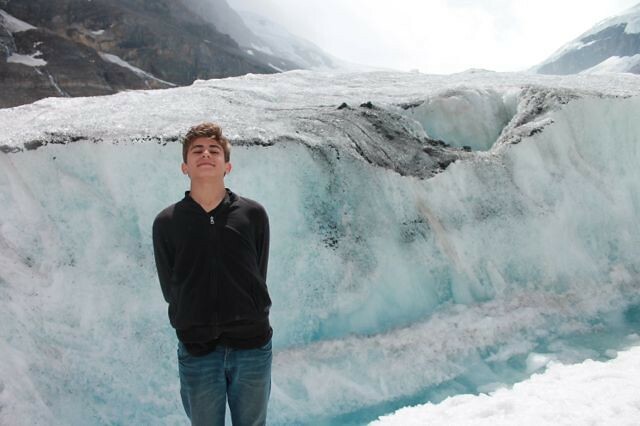 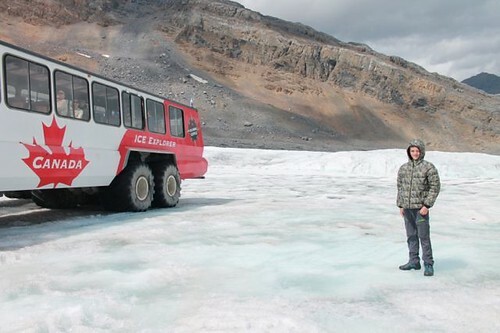 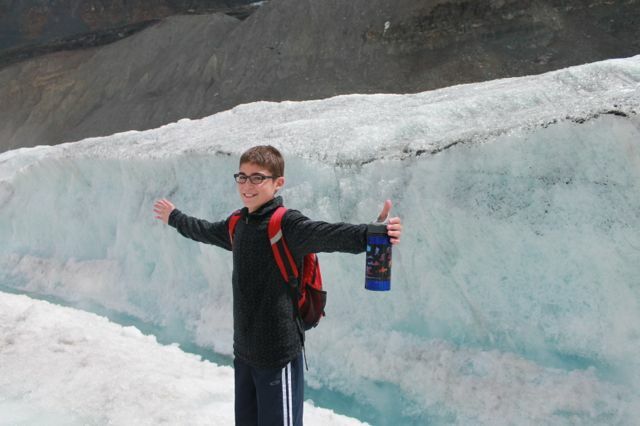 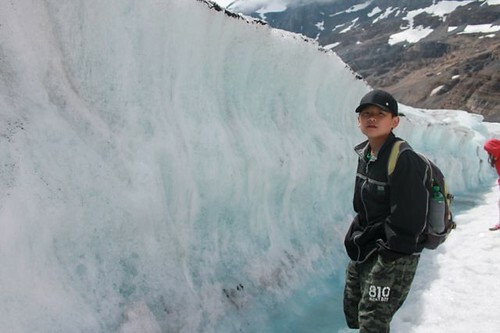 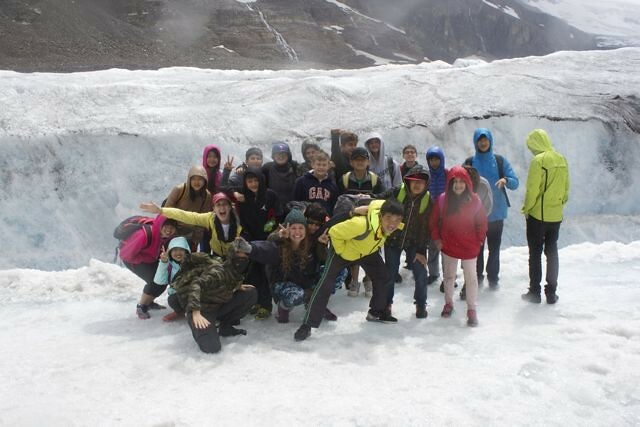 The tour of the Athabasca Glacier was certainly very ‘cool’! 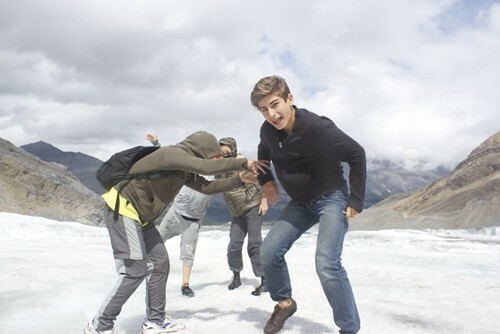 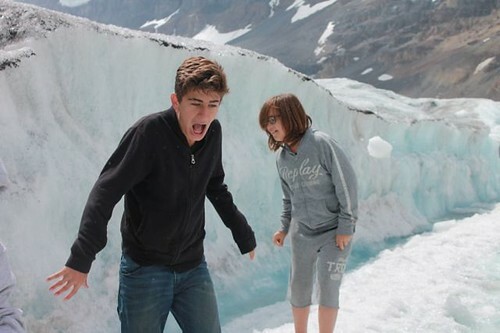 We got to drink fresh, cold, glacier water and walk around on ice in the middle of July! 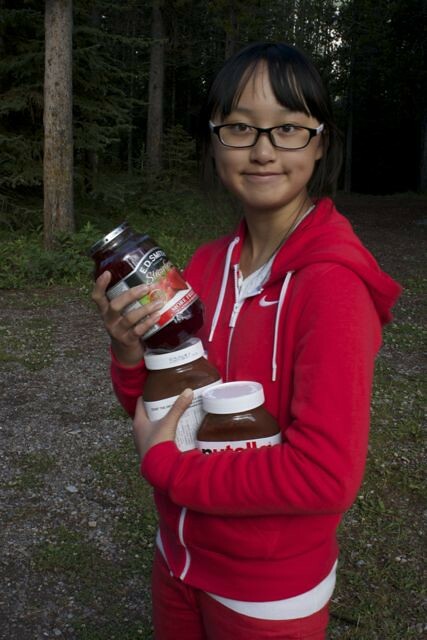 On the way back to Lake Louise we stopped at some scenic lookouts to take some pictures. The horseback-riding group had an amazing time, riding on playful horses, through the beautiful landscape, in the lake and on trails. Both groups had a chance to shop for souvenirs to remember their time exploring the Rockies. We got back to our campsite in the evening and whipped up a yummy dinner of ravioli, sausage and veggies. 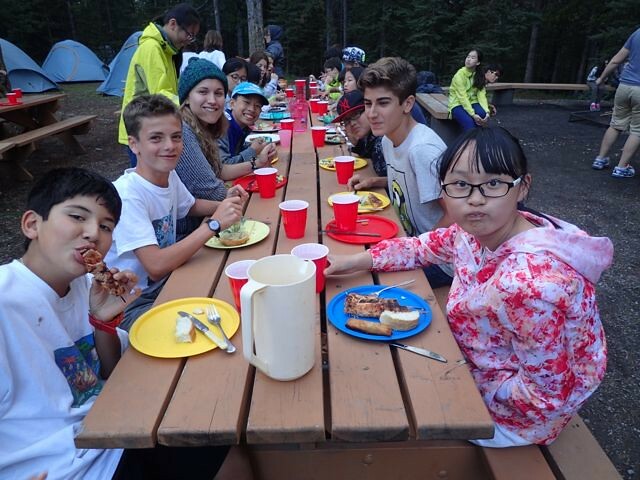 After cleaning up was done, we enjoyed our last campfire and snuggled into our sleeping bags for our last night. 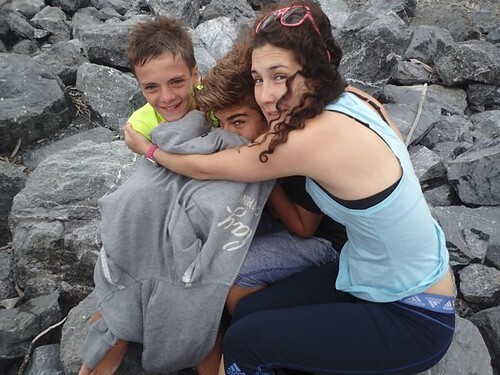 Thursday morning came surprisingly quickly and after breakfast we began to pack up our tents and belongings. Soon enough it was time for lunch, which was burritos, vegetables and fruit. 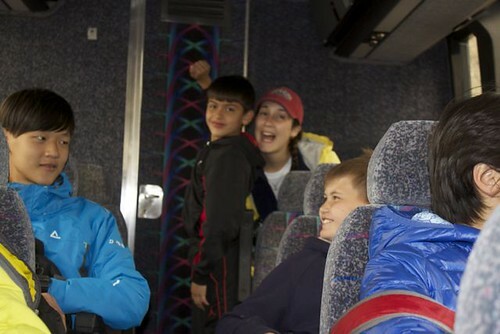 As soon as we finished up, our bus arrived to pick us up and drive us back to civilization – aka the city of Calgary. 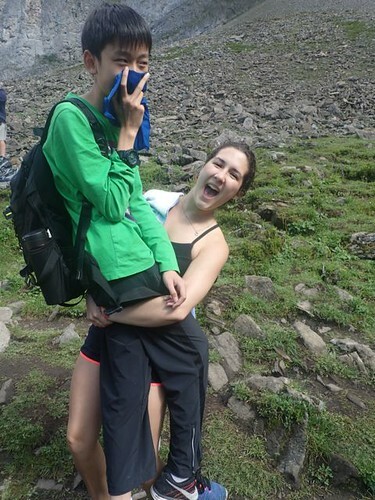 It’s hard to believe how fast our camping trip flew by, we had so much fun!